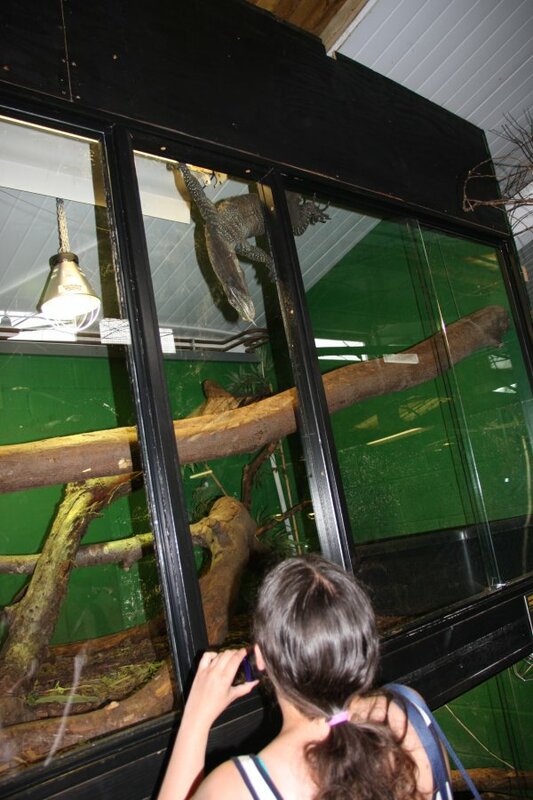 This gallery covers visits to Crocodiles Of The World in Oxfordshire, and the Wales Ape & Monkey Sanctuary. Which is in Wales. Of course. 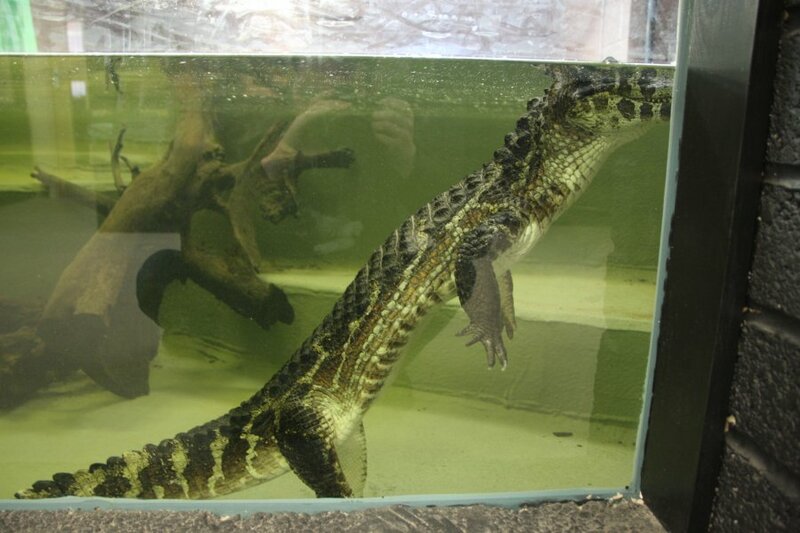 Cuvier's dwarf caiman, a South American species. 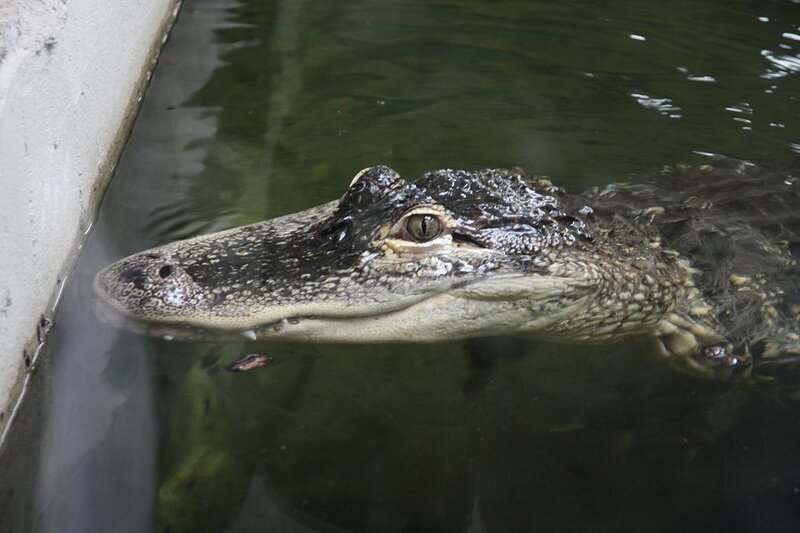 Despite often being referred to as caiman crocodiles, caimans are in fact more closely related to alligators than to true crocodiles (of course, they are all crocodilians, so both names could be accurate). 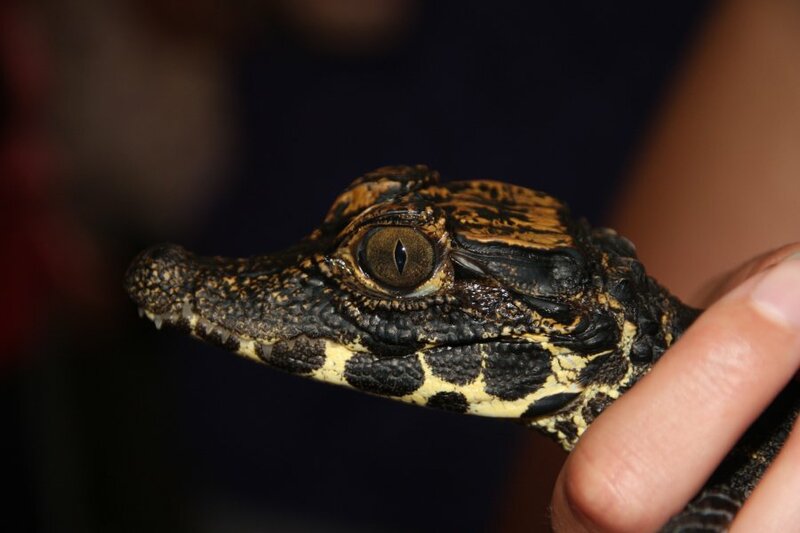 Whatever they are, they are the smallest of all crocodilians, but that doesn't mean they are small. 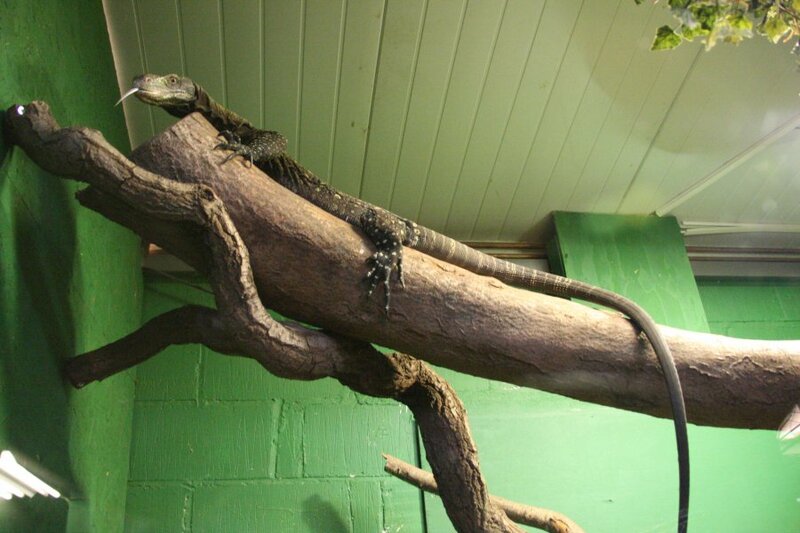 A small female may be 1.2 metres long, but a large male can reach 1.7 metres. 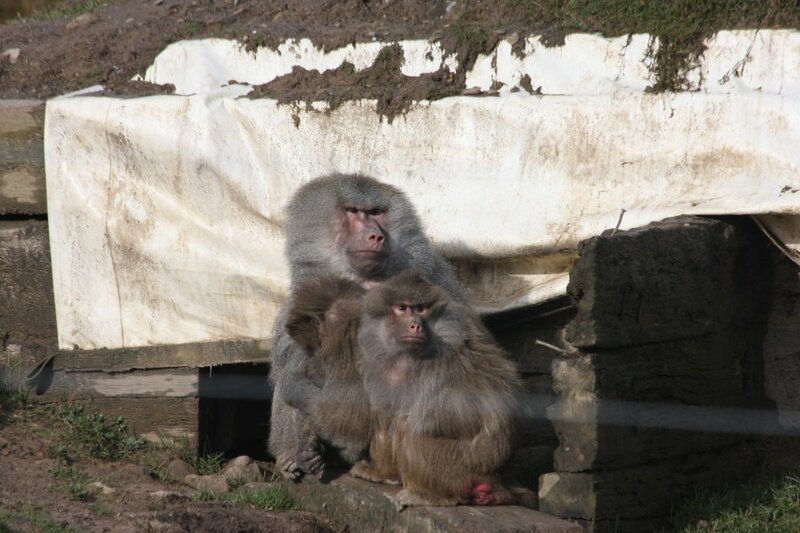 These are one of the species that are popularly kept by the handful of DWA license holders in the UK. 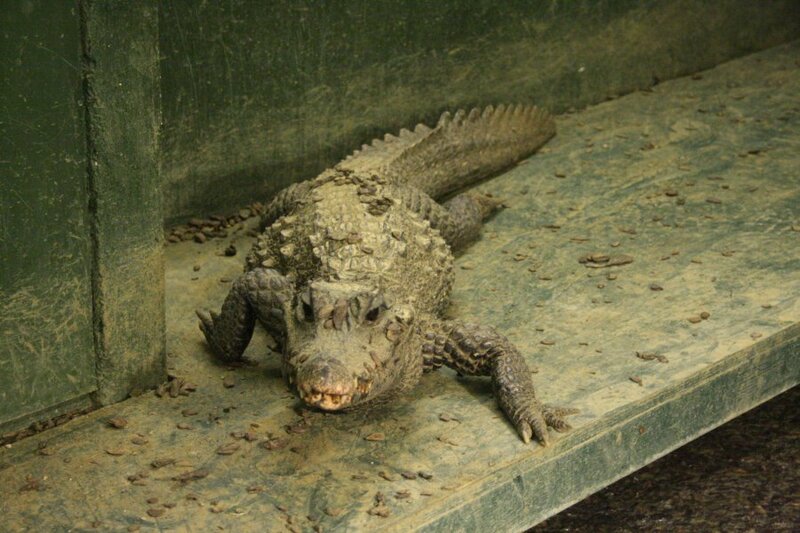 Yacare caiman, an only slightly larger South American species, between 1.4 and 2.5 metres. 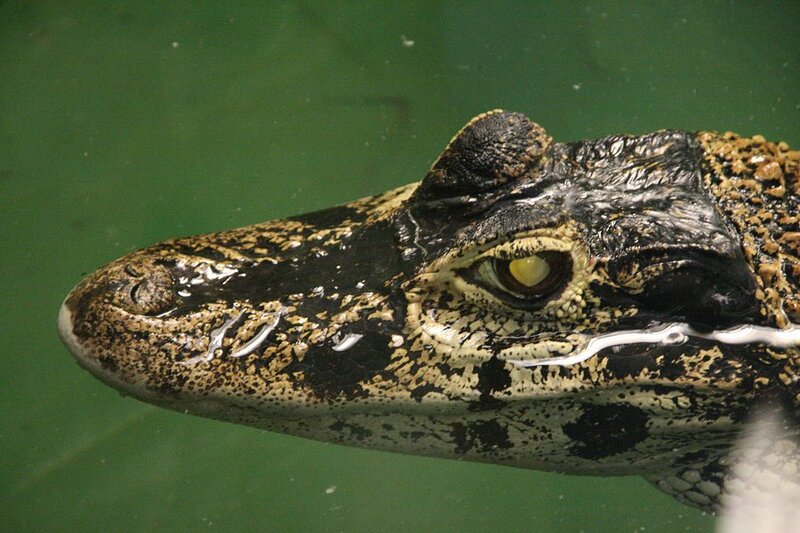 The Chinese Alligator, the smaller of the two alligator species, usually between 1.5 and 2.1 metres. 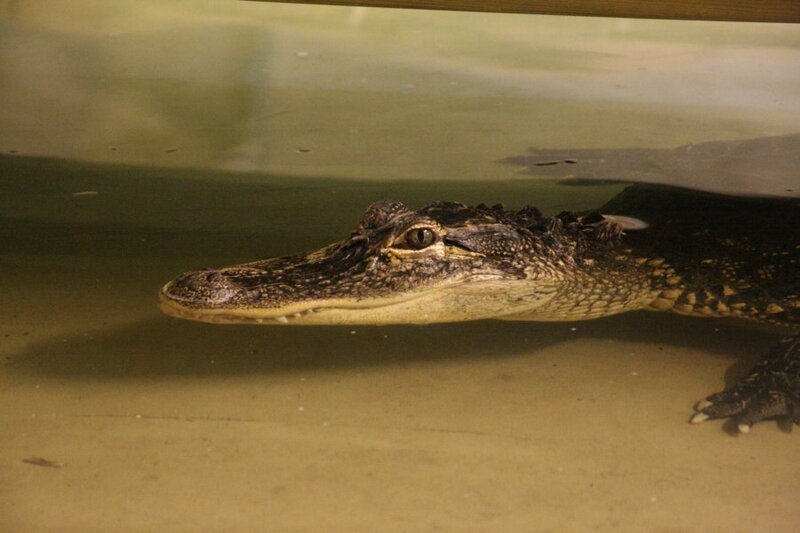 A female American alligator called Daisy. These are much larger, with females reaching up to 3 metres. Males average 3.7 metres and max out at over 5.3 metres. Being quite intelligent, they are trained to obey commands, recognising their names, following the pole, and staying still when told to. Wait! And he obeys. A fairly large male American alligator, known as Albert. 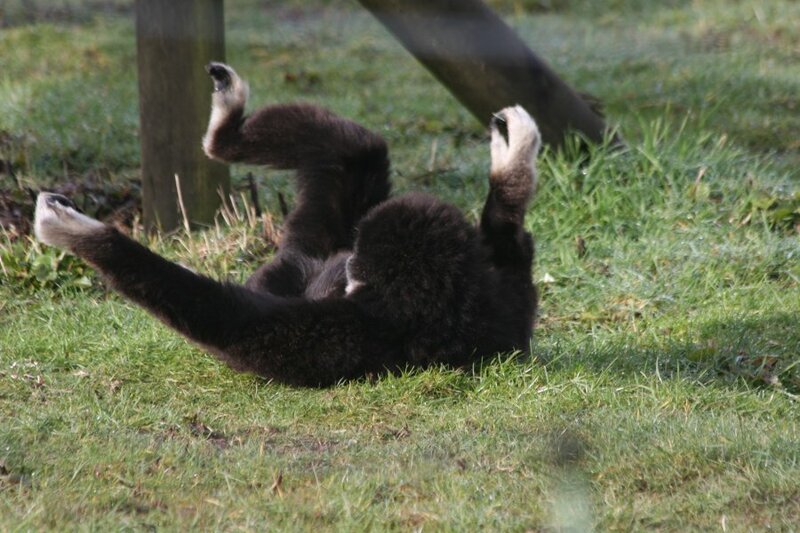 Even though he is fairly well trained, he does occasionally push the boundaries, and the keepers have to keep close watch on him, just like all the others. Rewarded for obedience with some fish. 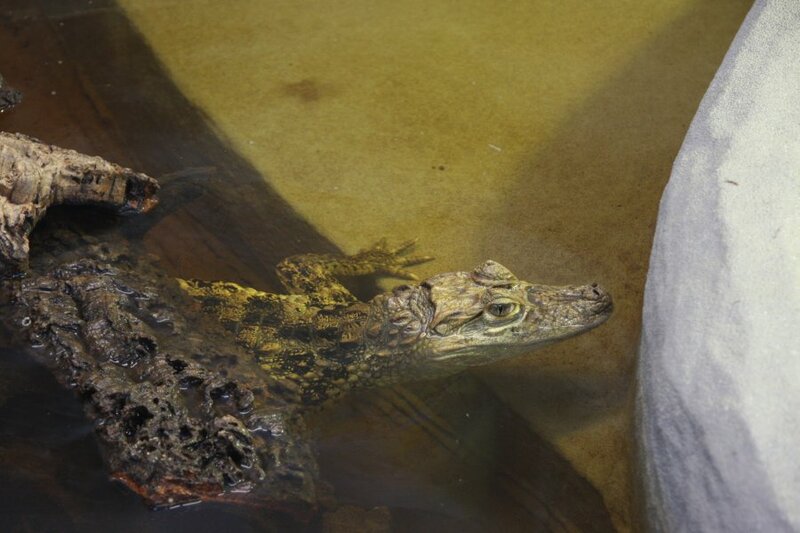 Black caiman demonstrating eyeshine. 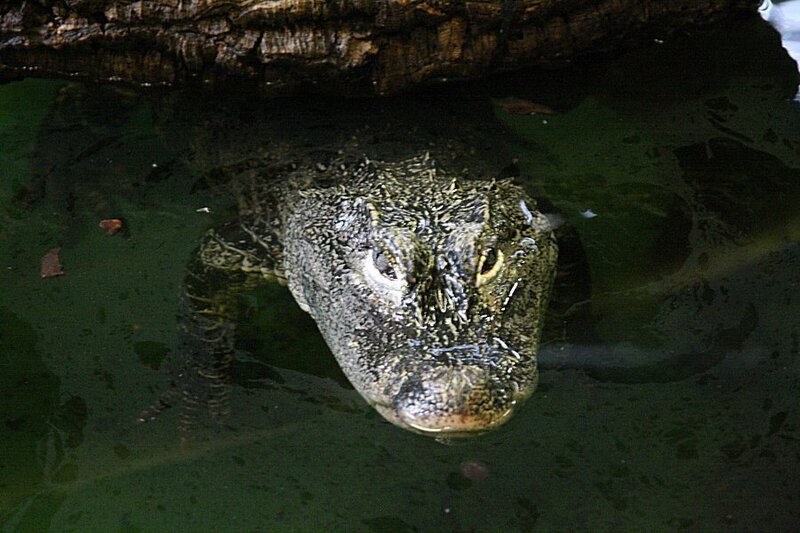 This is a very large caiman species from the Amazon, reaching 2.8 to 4.3 metres normally, and exceeding 5 metres in rare cases. 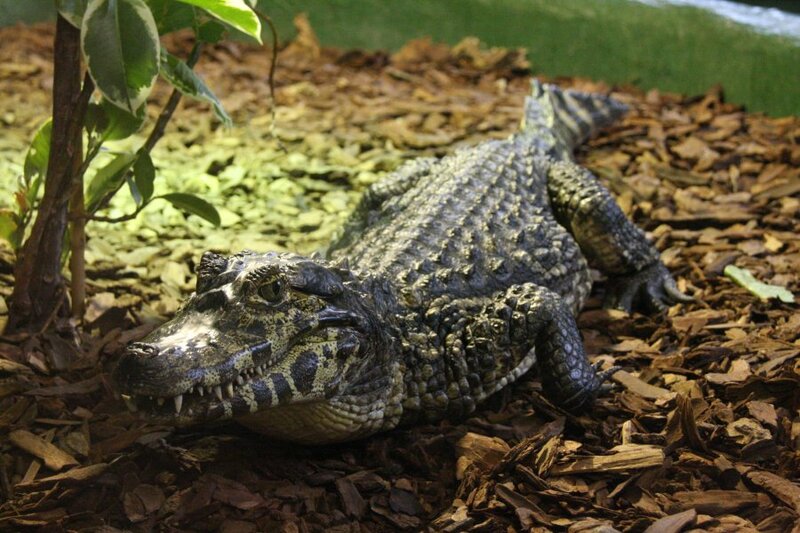 On average, they are usually longer than the American alligator, and are therefore also the longest Alligatorid on average. 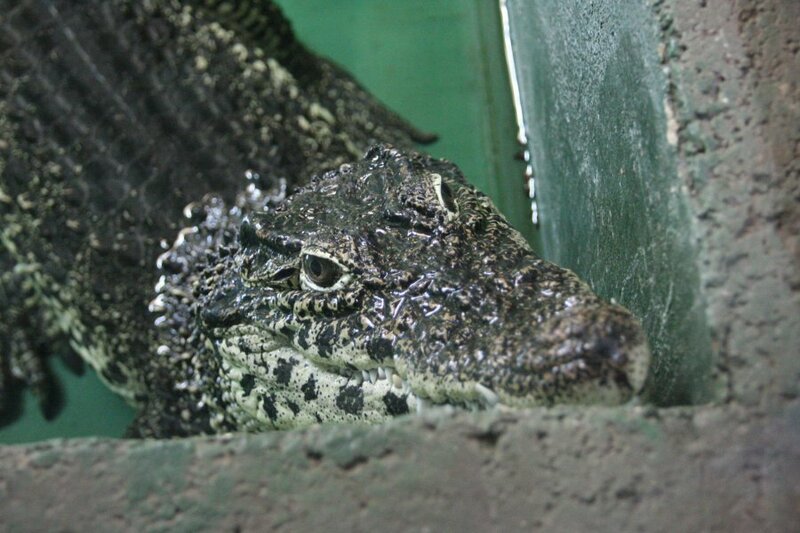 The maximum recorded size of the American alligator is bigger, however. The skull is exceptionally long for the overall animal length, and extremely powerful. 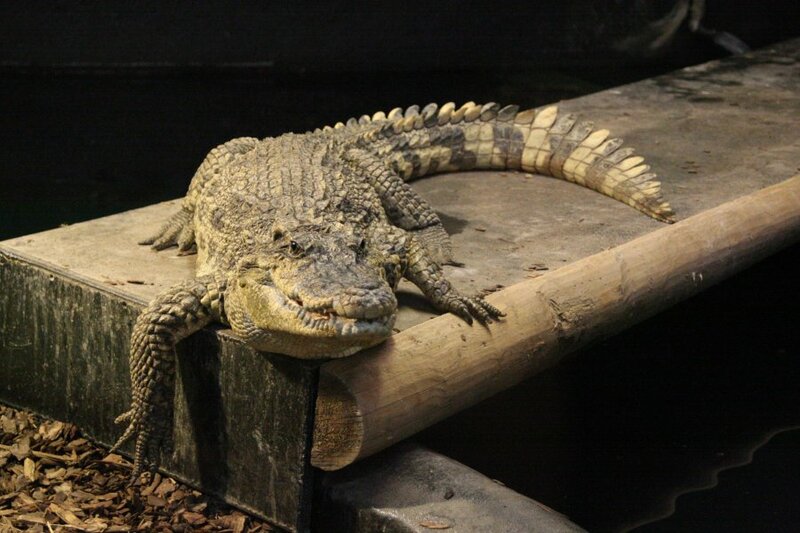 West African dwarf crocodile, the smallest of the true crocodiles, normally about 1.5 metres long, and maxing out at just 1.9 metres. 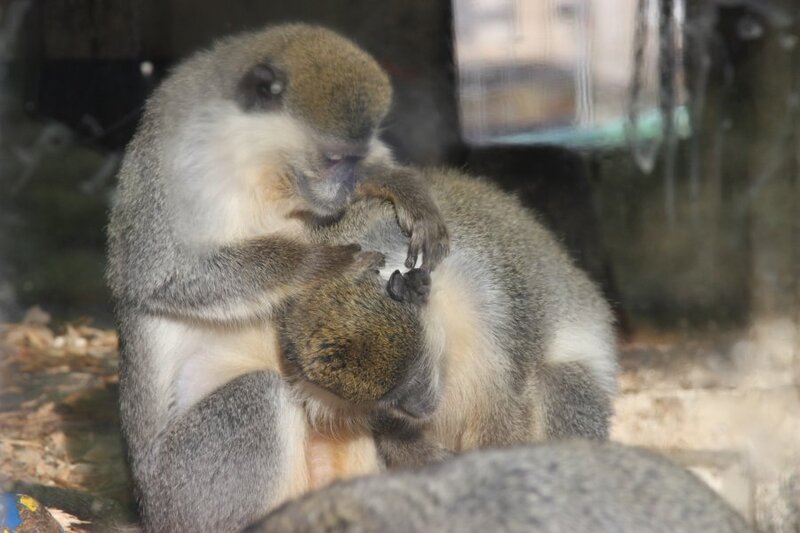 Despite the name, they are also found in the Congo basin in central Africa, and within West Africa they are only found along the southern edge. 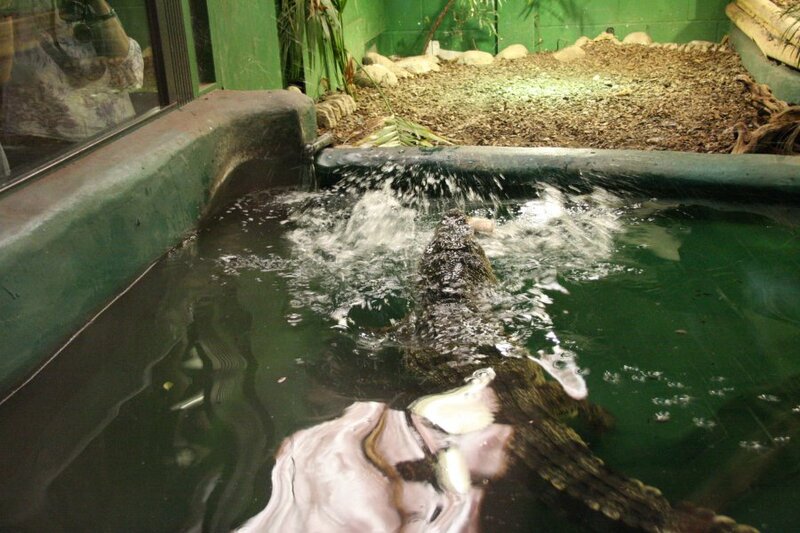 Cuban crocodile, typically 2.2 metres long, and reaching a maximum of 3.5 metres. Cuban crocodile comes up for a visit. Offers cigars. Hayley, a female Siamese crocodile. Females usually reach 2.1 metres, or a maximum of 3.2 metres. Hayley demonstrating the gag (palatal valve) effect that prevents crocodiles from constantly swallowing or breathing water. The openings of both the thrachea and oesophagus are hidden behind that watertight flap of skin. 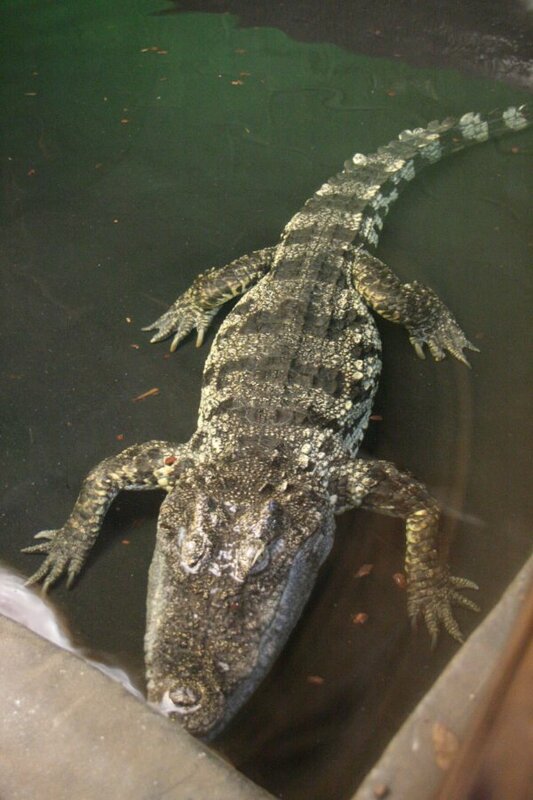 Scara, a male Siamese crocodile. Males normally reach up to 3 metres, but in extreme cases can make 4 metres. Rebecca and Hugo, a larger pair. Rebecca is renowned as the one that bit the leg of head keeper Shaun Foggett (of "Croc Man" fame) a number of years ago when he was distracted for a moment, leaving him with a very obvious scar. 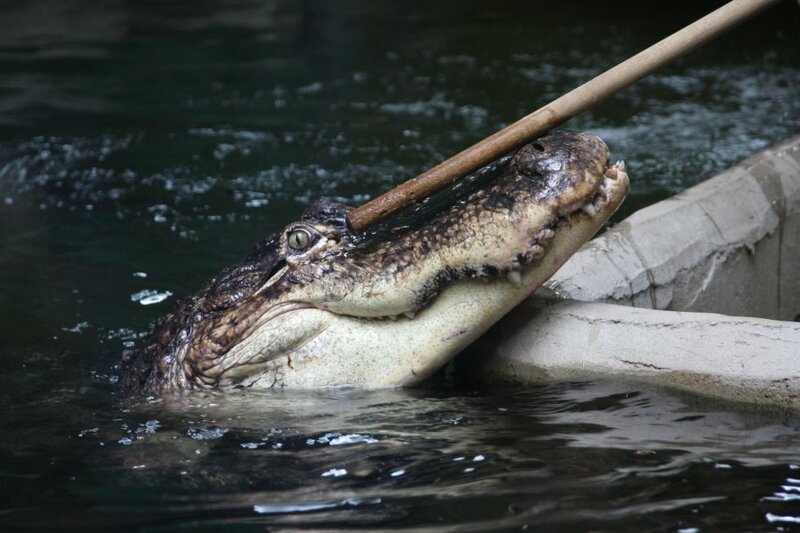 They are trained to some extent like the alligators, but this just shows that these animals are DWA for a reason, and require constant vigilance. This species originally came for the entire southeast Asian peninsula and archipelago, but are now only found in Cambodia. 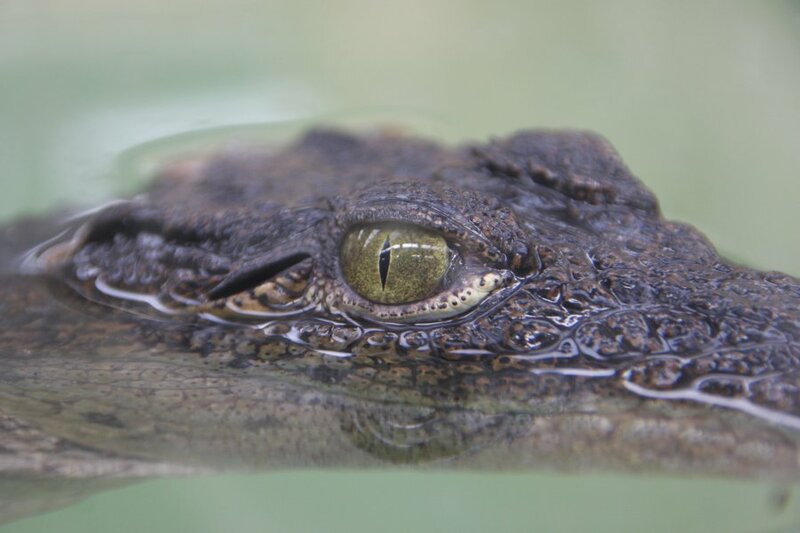 Repopulation programs are in place, but are sadly using partial saltwater crocodile hybrids, which were cross-bred with the Siamese crocodiles by the reptile leather industry. 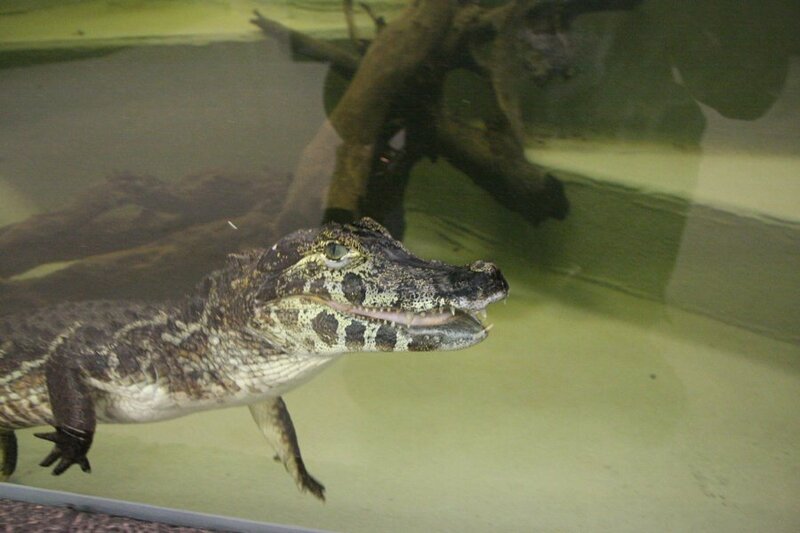 In future, there will likely be no pure Siamese crocodiles left in the wild. Most agile underwater, and seemingly lazy on land. However, they can run very effectively too. Not to be underestimated. Hugo catching fish, as a reward for recognising his name. 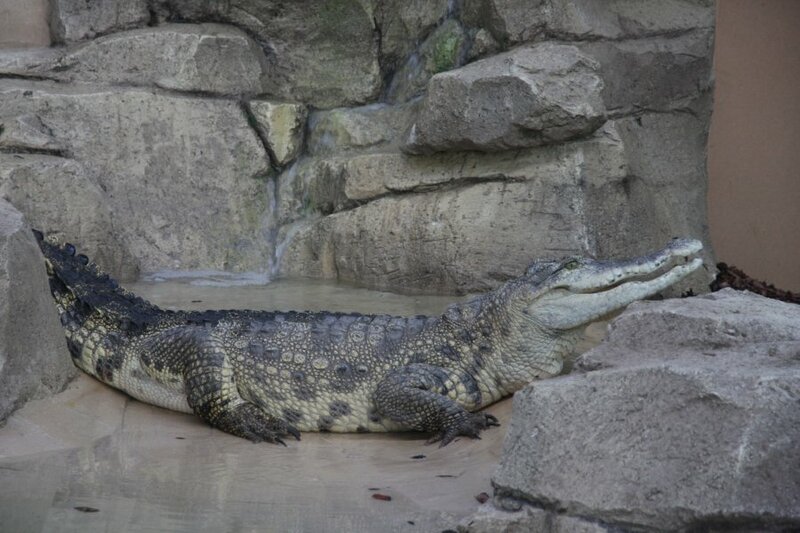 Nile crocodiles, the second largest crocodile, averaging between 2.4 and 3.8 metres for females and 3.5 and 5 metres for males. 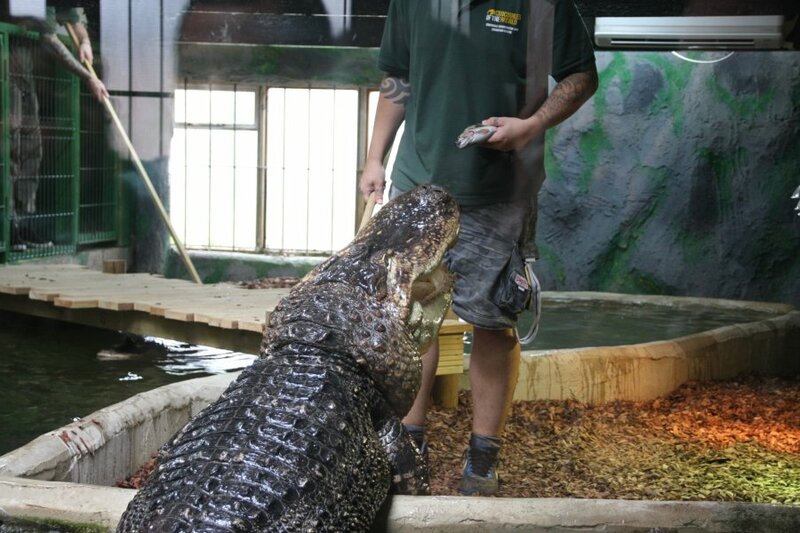 The record for a male is 6.47 metres, making them only 60 cm shorter than the saltwater crocodile's record (and a similar amount less than the average). 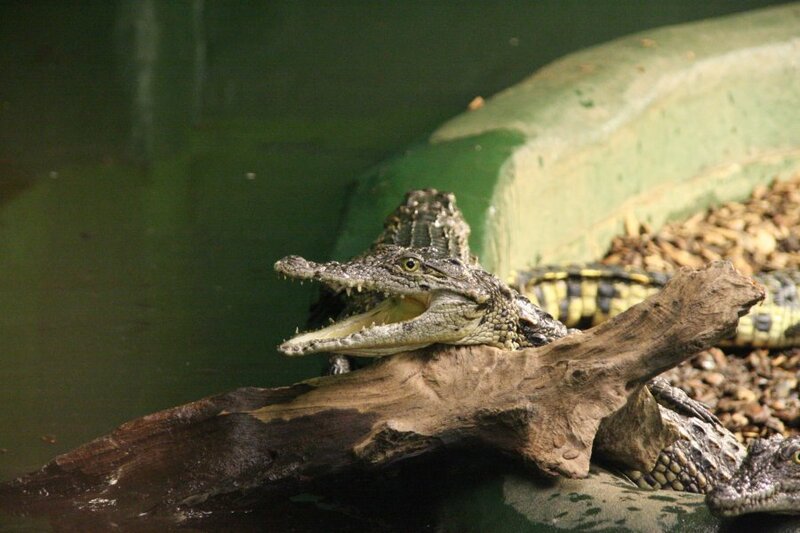 Despite their name, Nile crocodiles are found over most of Africa, except the Sahara and the southern tip of Africa. 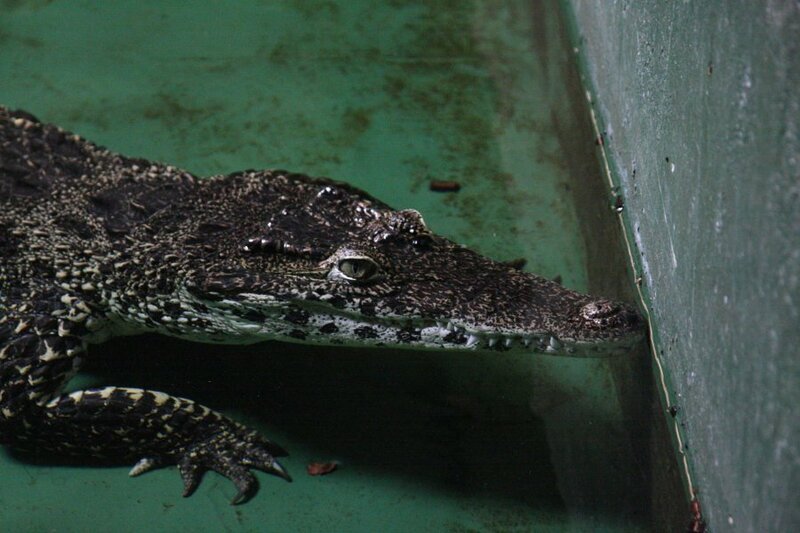 They are the main crocodile that monitor lizards watch out for, giving them their name. 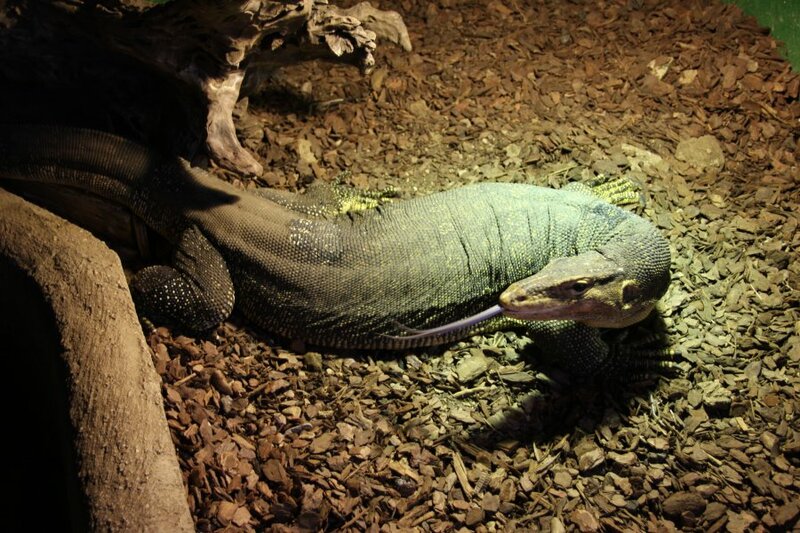 As well as crocodiles, the zoo also has some of the larger monitor lizards. 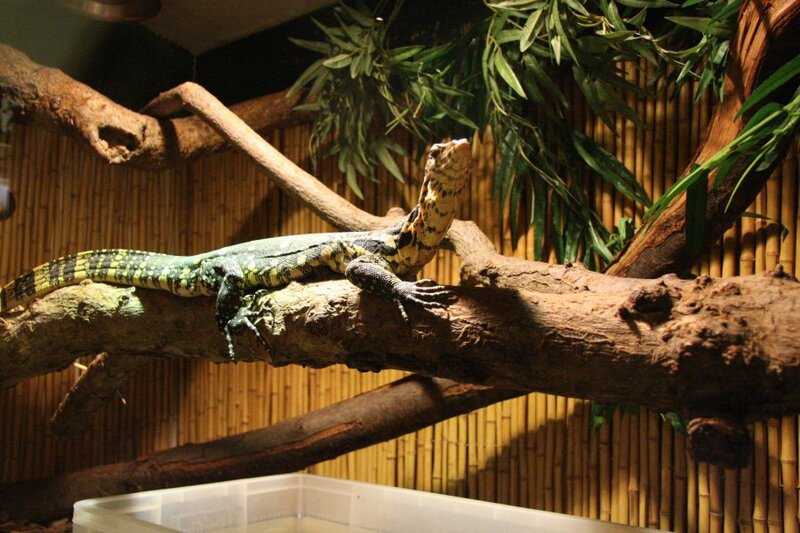 This is the Asian water monitor. When it comes to length, 1.5 to 2 metres is normal, and 3.21 metres is the maximum. 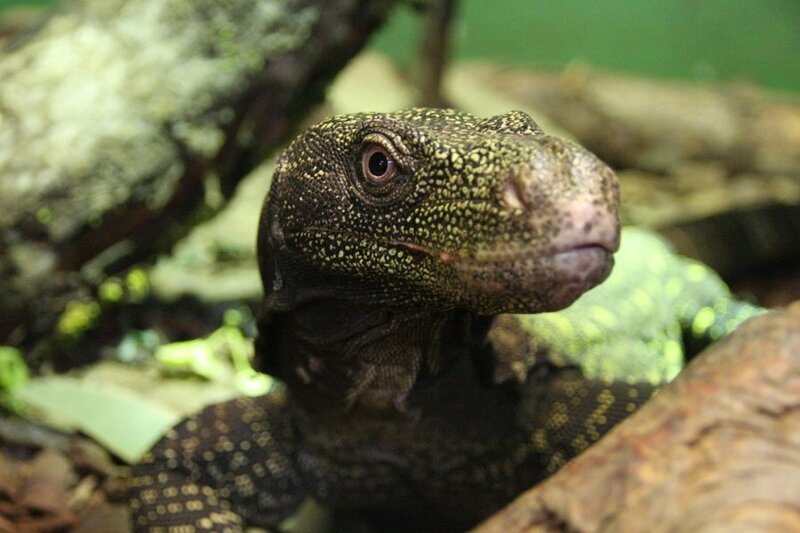 Although their average is shorter than that of the Komodo dragon's 2.3 metres (female) and 2.6 metres (male), the longest Komodo dragon was 3.13 metres, making the Asian water monitor either the longest or second longest known lizard, competing with the crocodile monitor. 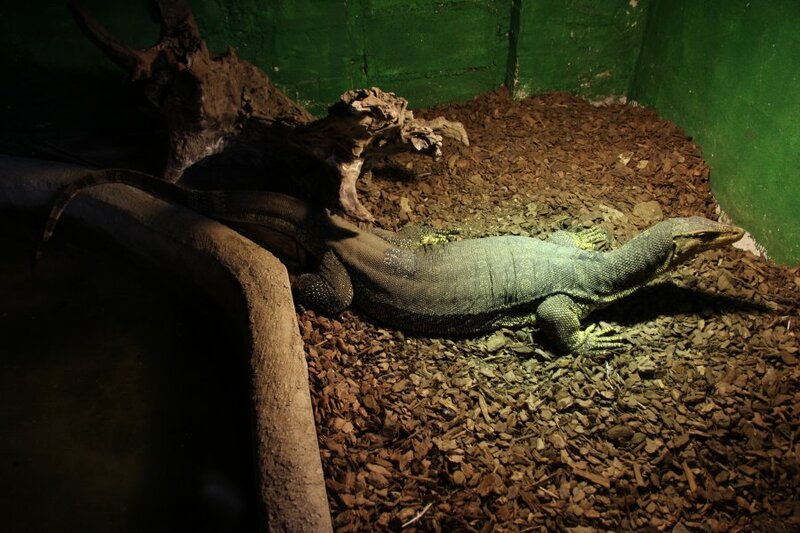 The Komodo dragon is usually around three times the weight, however, and still holds the record for the heaviest lizard. 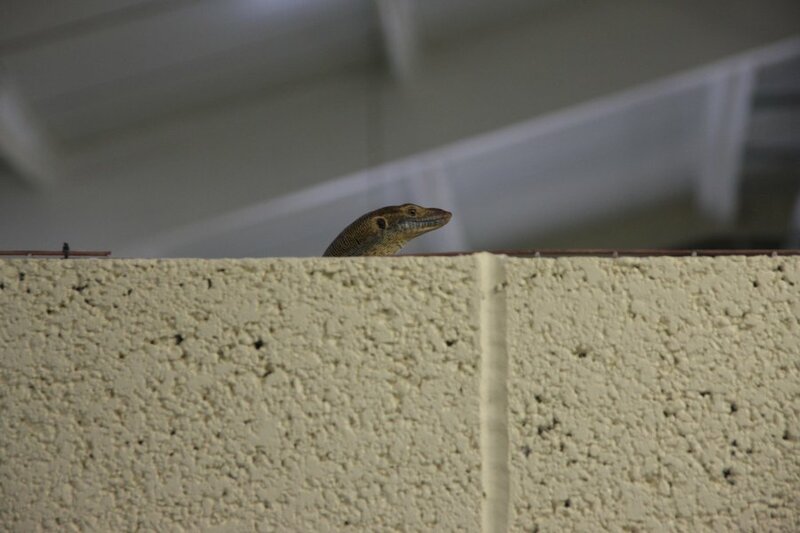 Despite their size, individuals can become quite tame, at least moreso than most of the other large monitors. He just wants a cuddle. 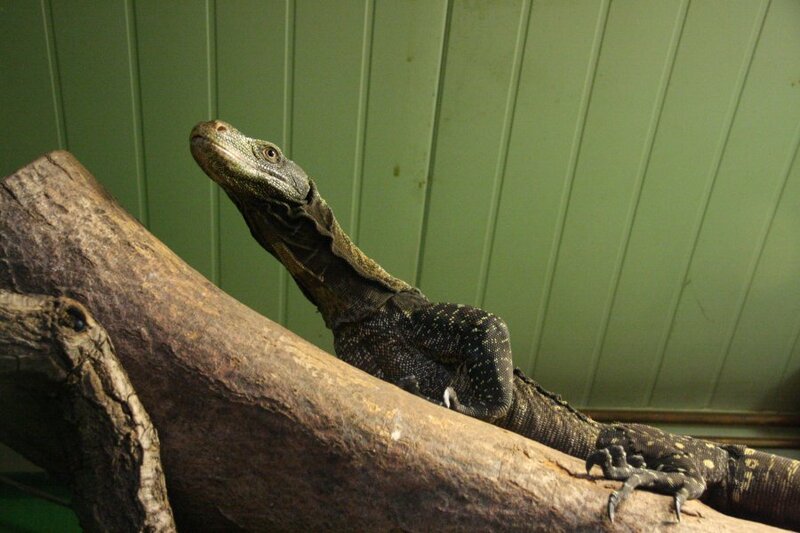 Then there's the crocodile monitor from Papua New Guinea. This is their smaller one. 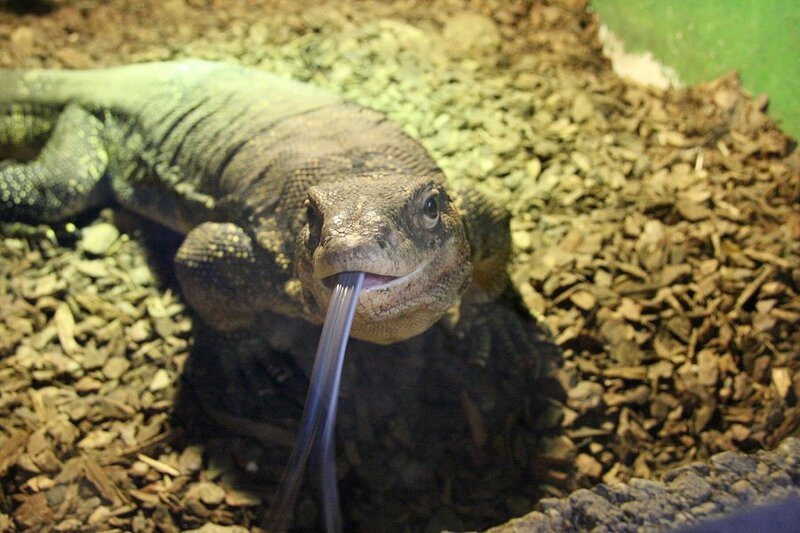 These monitors are one of the most dangerous, despite not being venomous, due to having the largest claws and longest teeth of any lizard. 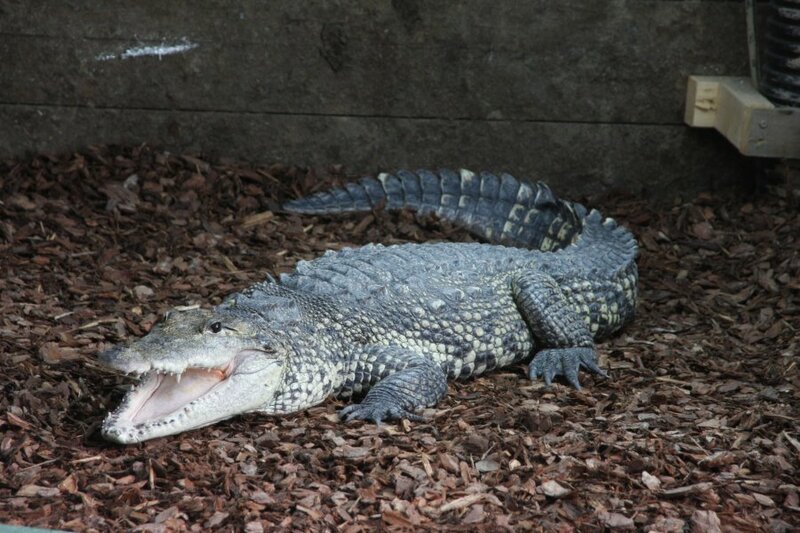 Not only that, but the teeth are serrated instead of curved, and can inflict extremely severe wounds. Add to that their attitude; they are known for their habbit of suddenly launching surprise attacks without warning, aimed at their keeper's face. These are not an animal to underestimate. Very agile, and somewhere ... up ... there. 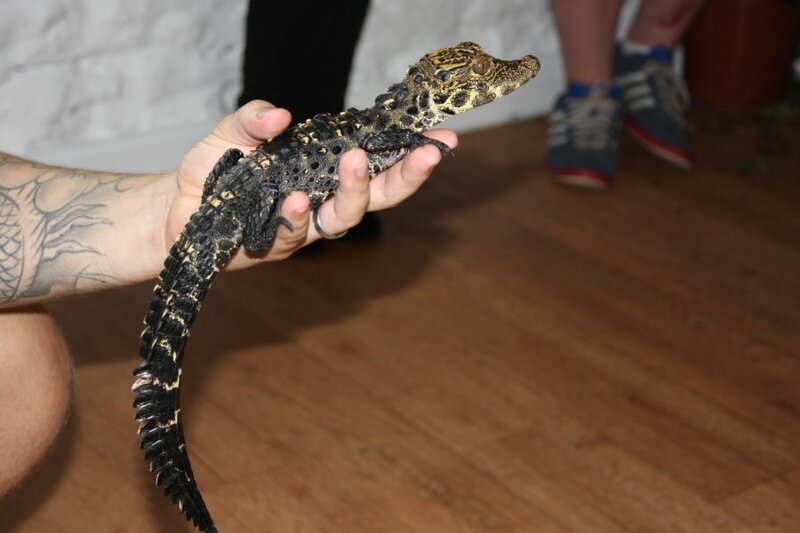 We were here for a special behind-the-scenes visit, but even regular visitors can hold young West African dwarf crocodiles, under the guidance of trained and licensed professionals. 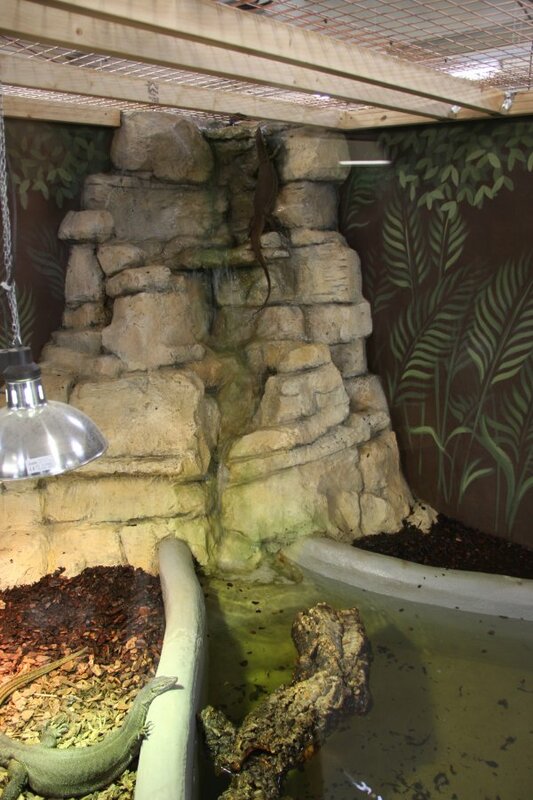 These hatchlings were bred here, as were several of the others. 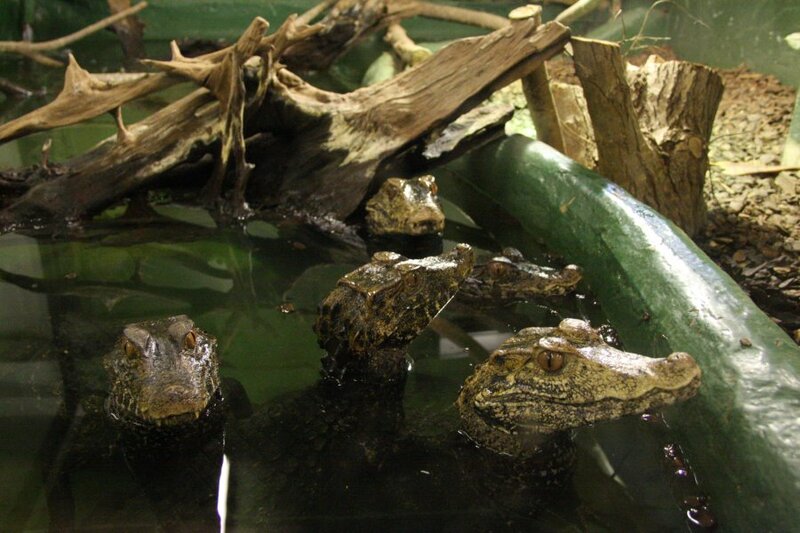 Although the crocs may display a threat pose, they are very well behaved. Who couldn't love a face like that? 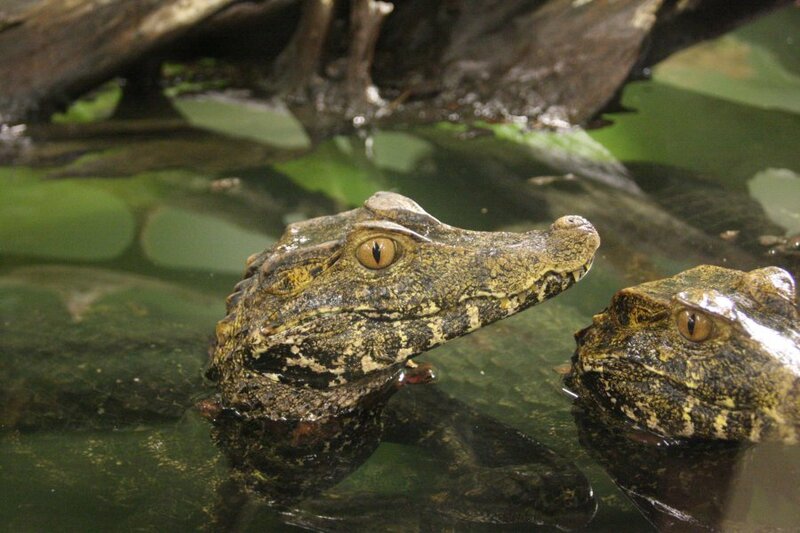 The spectacled caiman. 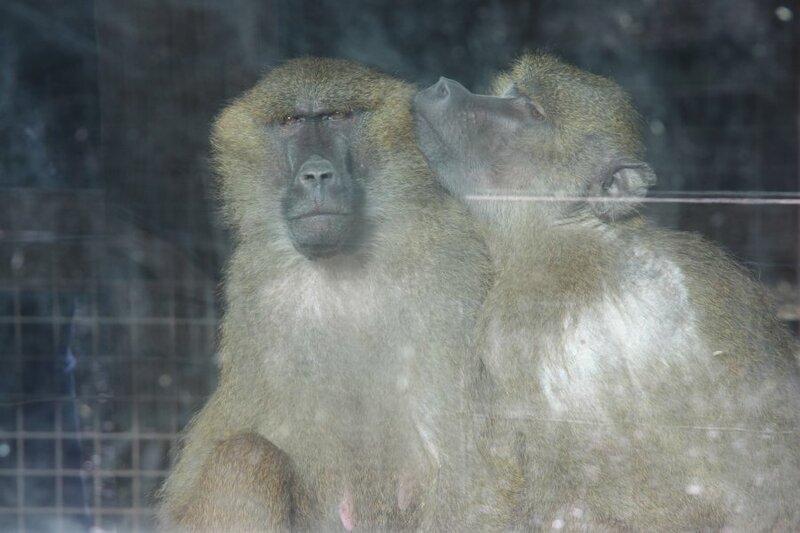 Females are normally 1.2 to 1.4 metres (maximum 1.6 metres) and males are normally 1.8 to 2 metres (maximum 2.5 metres). 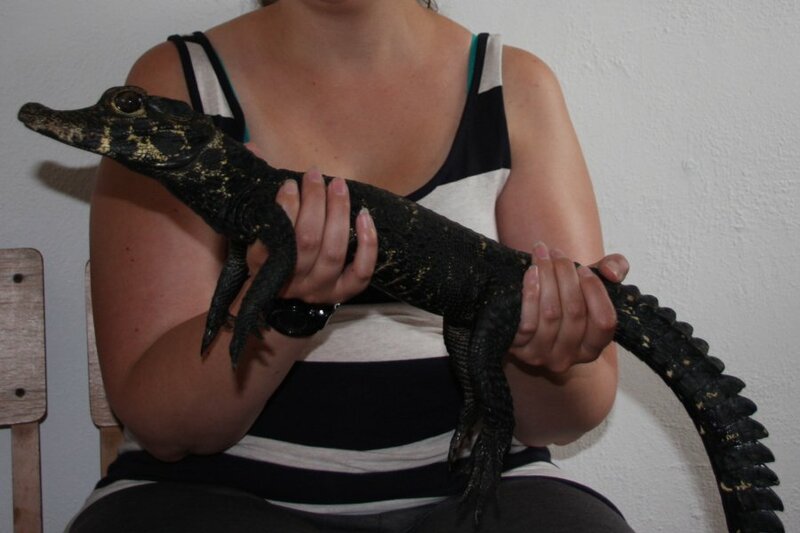 This one has reached a size where they are no longer happy to be handled by random people. 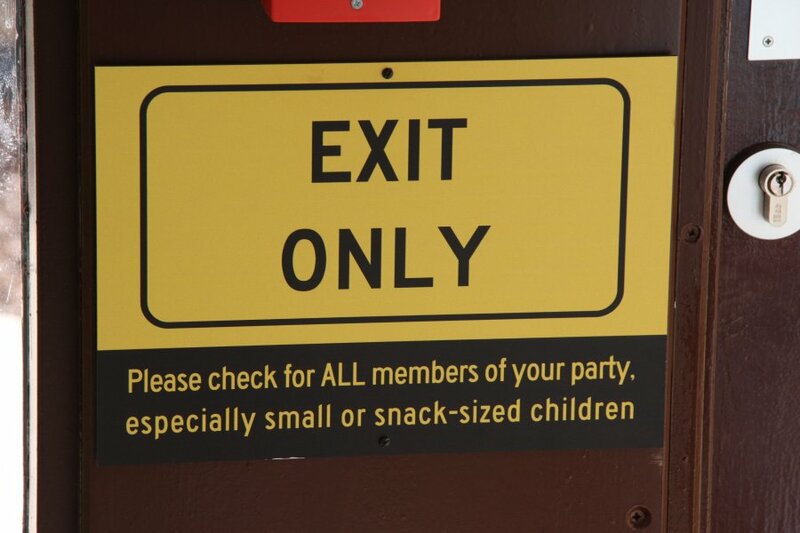 Individuals vary but 90 cm is apparently their limit. 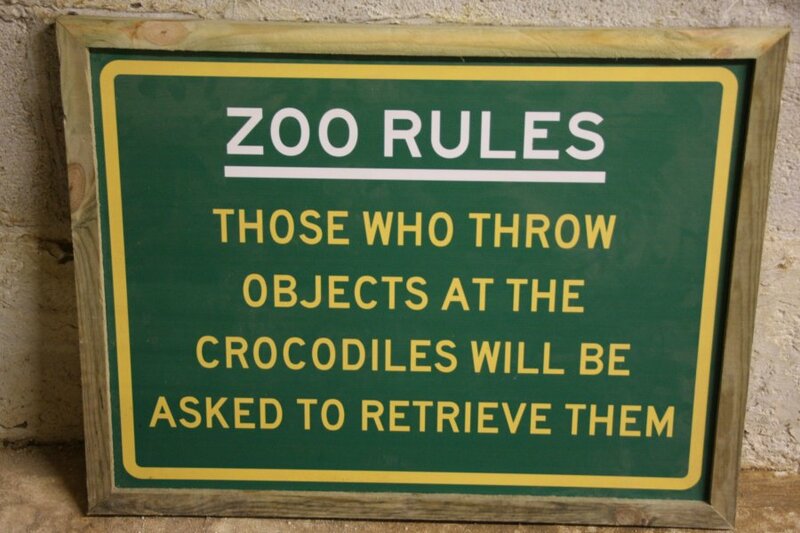 After that, the crocs lose their patience, and start strongly resisting handling. The little wrinkle in front of the eye is supposed to look like the bridge of a pair of spectacles, hence the name. I don't see it, but oh well. 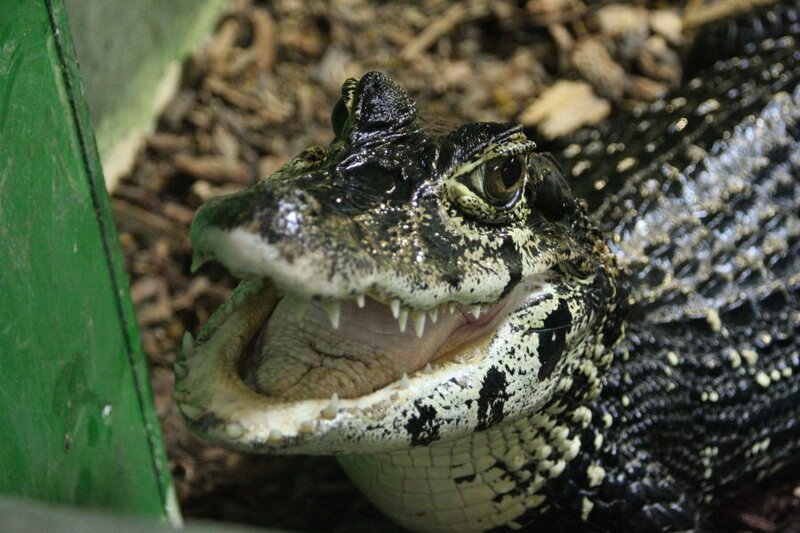 The lack of a pronounced tooth near the tip of the lower jaw protruding outside the upper jaw, shows that this is an alligator, not a crocodile. 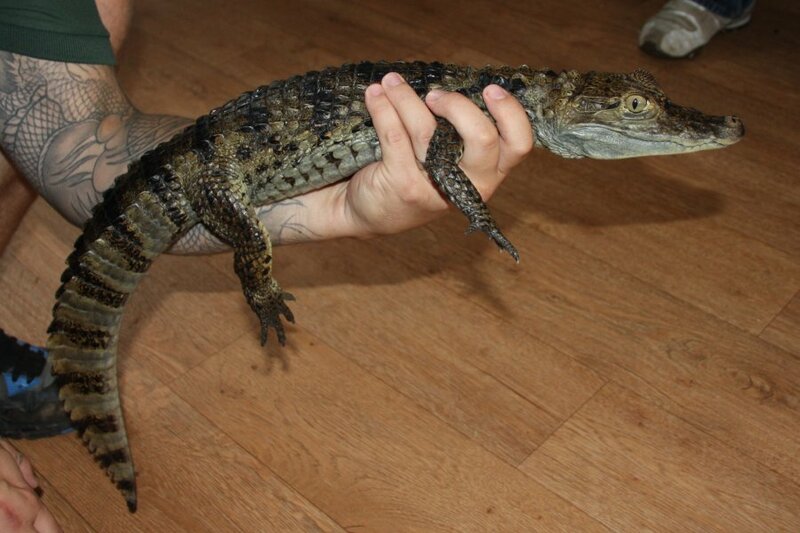 A West African dwarf crocodile at the upper limit of handleable size. Pretty cool to be able to hold it. 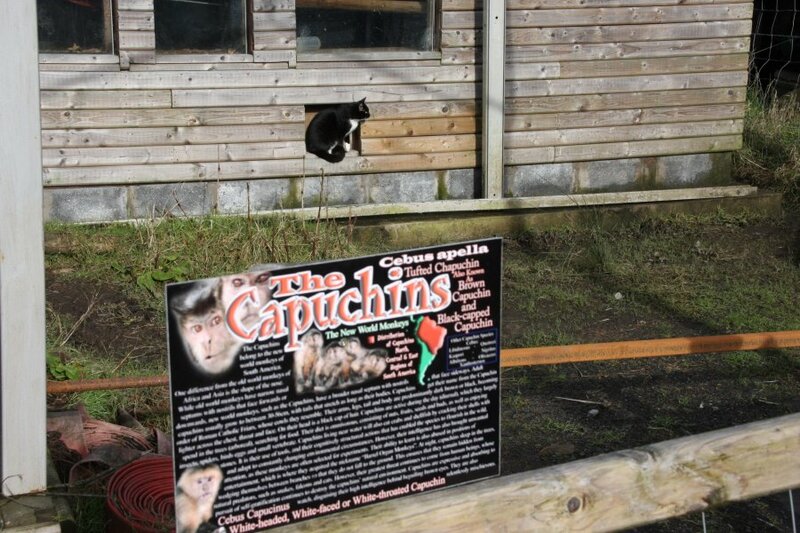 Now over in the Wales Ape & Monkey Sanctuary in South Wales. 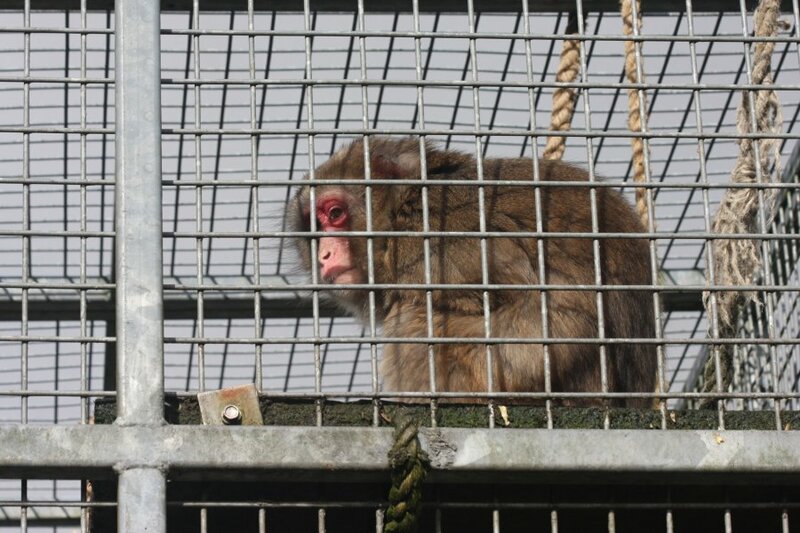 Sadly, despite offering a valuable service for the animals they care for, this site is not so well set up for visitors. 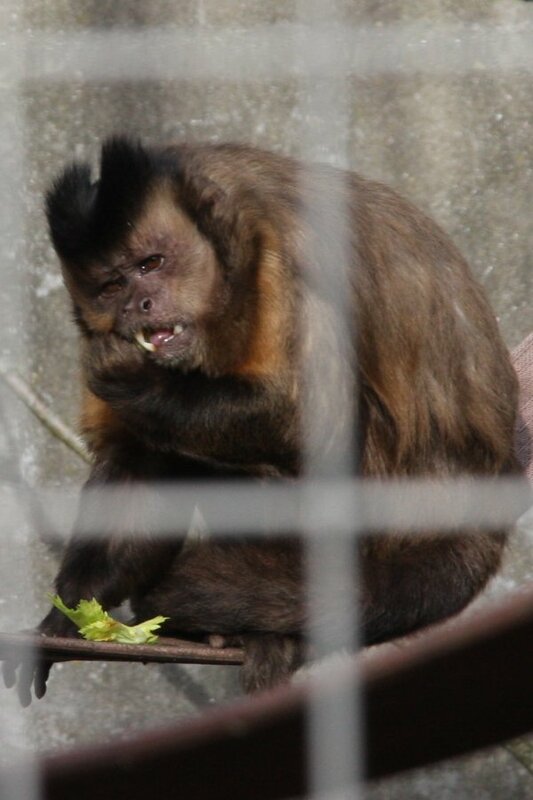 Most enclosures, such as this capuchin enclosure, use cages instead of glass. Fewer reflections, but it makes good pictures almost impossible. 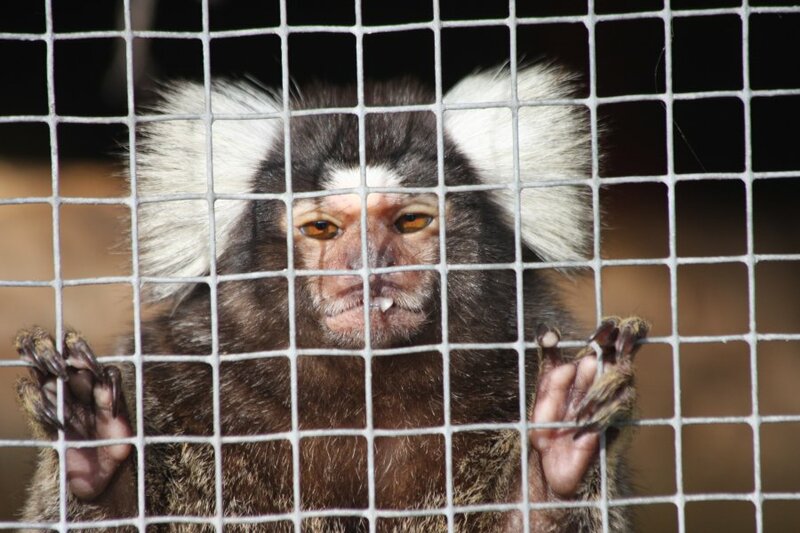 Try to ignore the cages (they are better for climbing animals, so it is for their benefit, not ours). Now offering full grooming service. 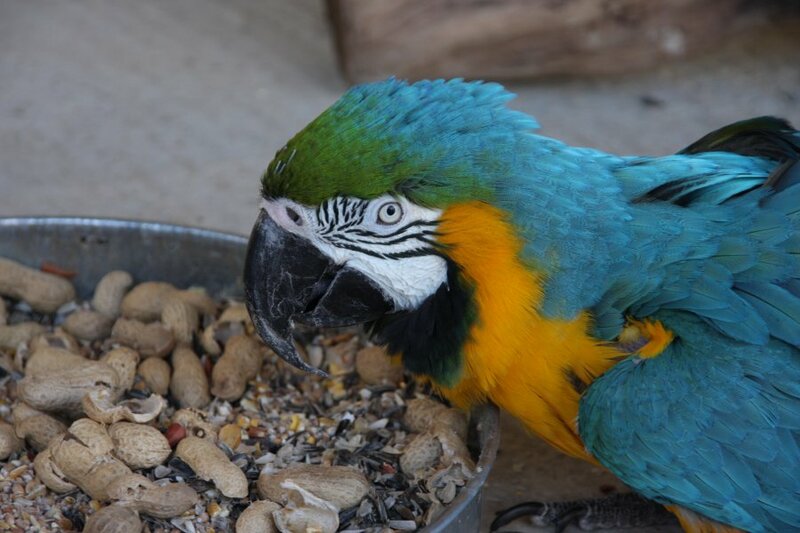 Most of the animals here are either rescues from owners who had not cared for them properly, siezed from illegal imports, or are recovered from cargo vessels when they had sneaked on board. 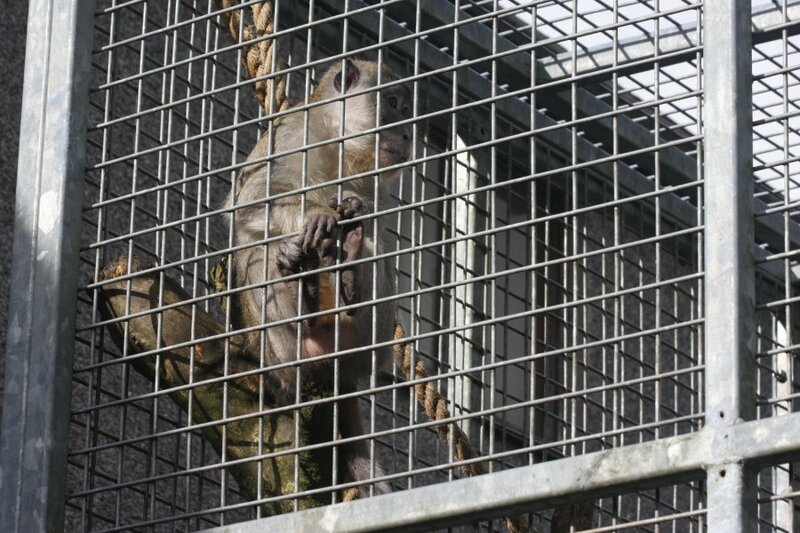 This crab-eating macaque, Sinbad, is one of the stowaway kind. Japanese snow monkey, famed for sitting in hot springs to keep warm in the depths of a snowy winter. Photographer self portrait. 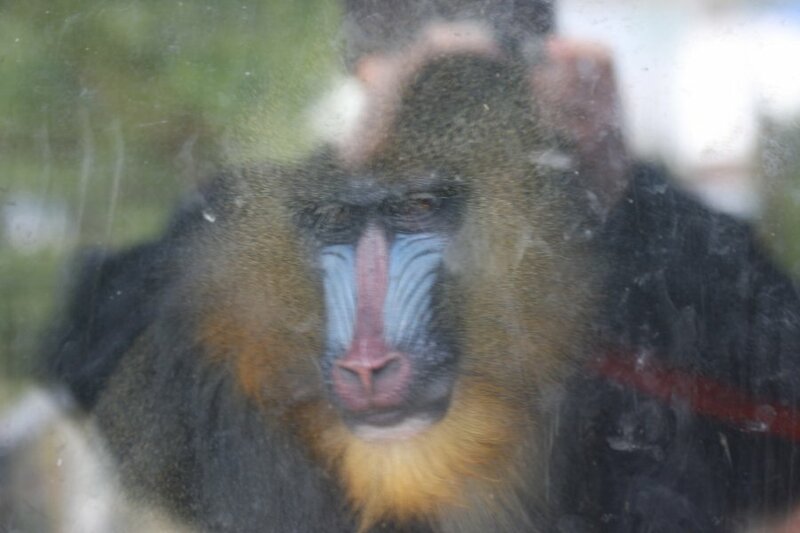 Oh, and a mandrill. Neither an ape nor a monkey (should it even be here? 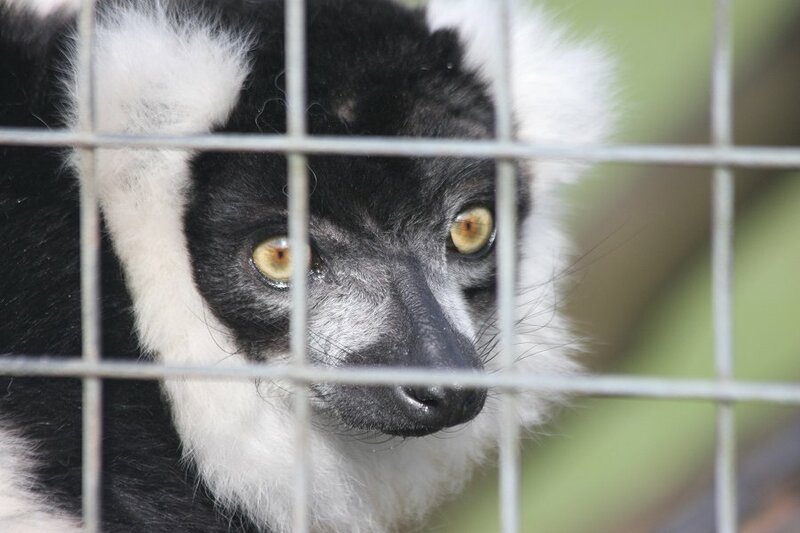 ), the ruffed lemur. 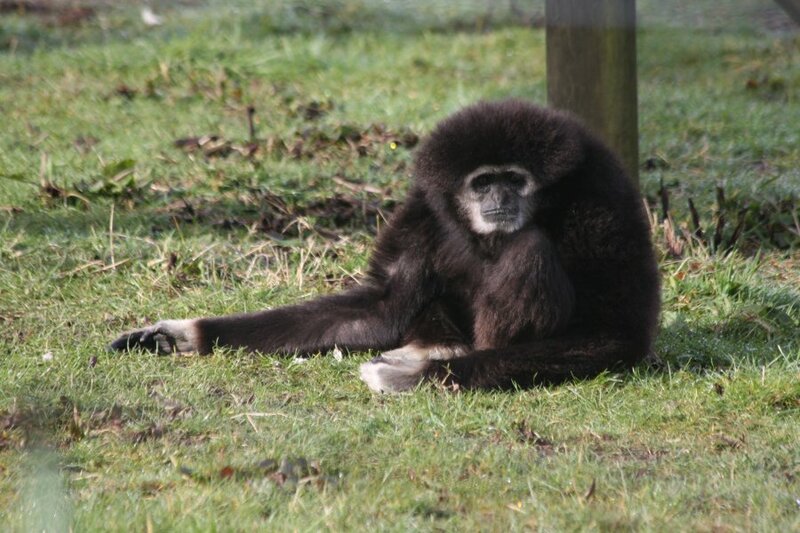 A lar gibbon, who often poses for photographs. Common chimpanzee. 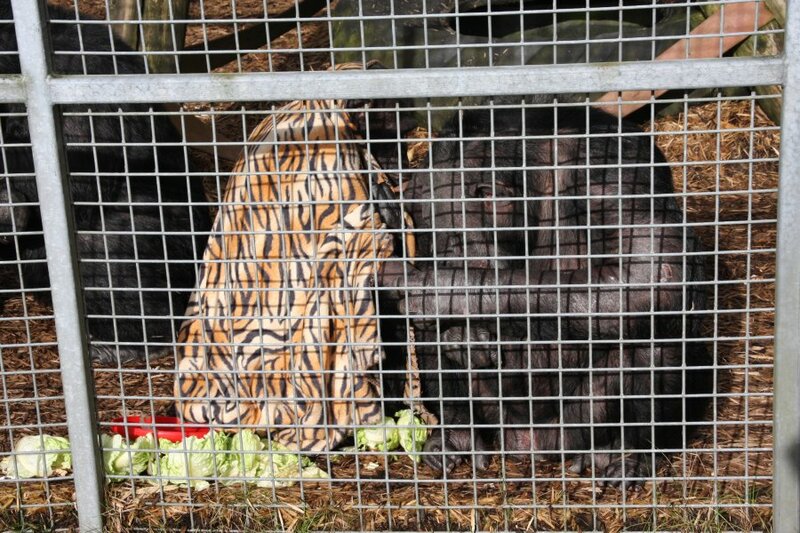 Although I normally would have avoided a picture showing so much cage and so little animal, there was something rather too funny about a chimp hiding under a tiger-striped blanket, and playing peekaboo with its neighbour. 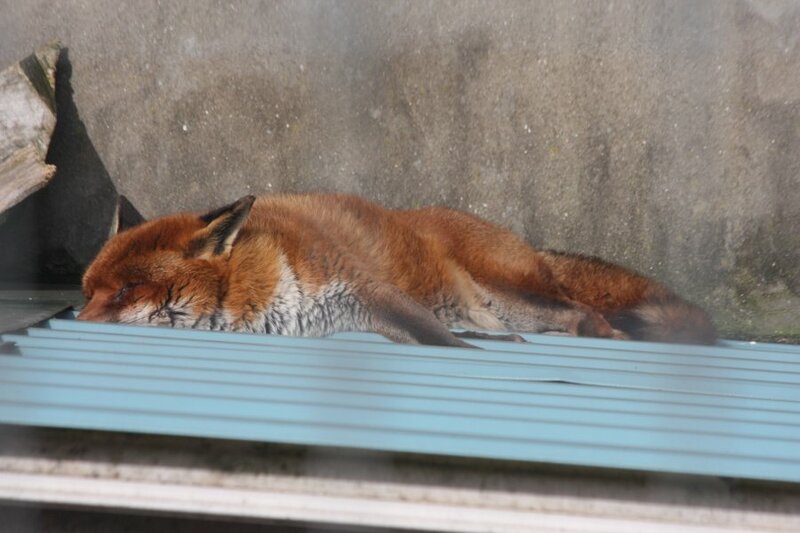 Occasionally posing for great photographs, the fox was in a lazy mood this time. Neither monkey nor ape (did you notice? 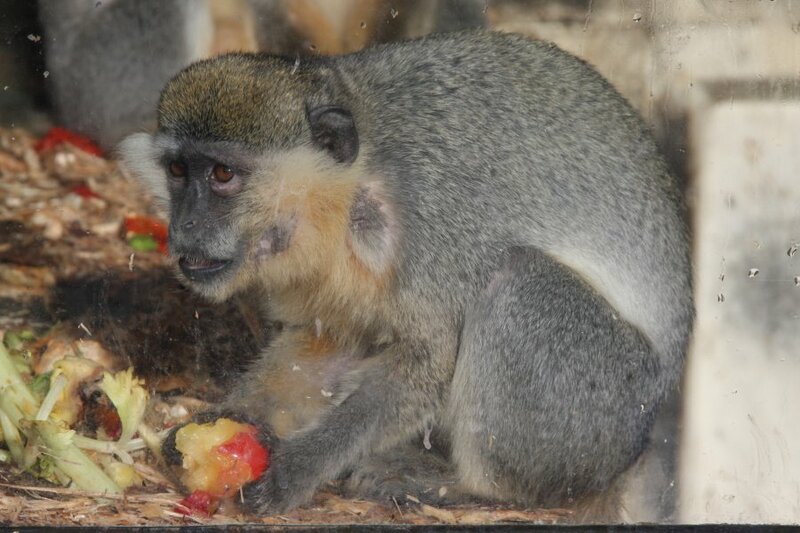 ), and not even a primate, this is a native animal who was found injured, and subsequently cared for by the sanctuary. 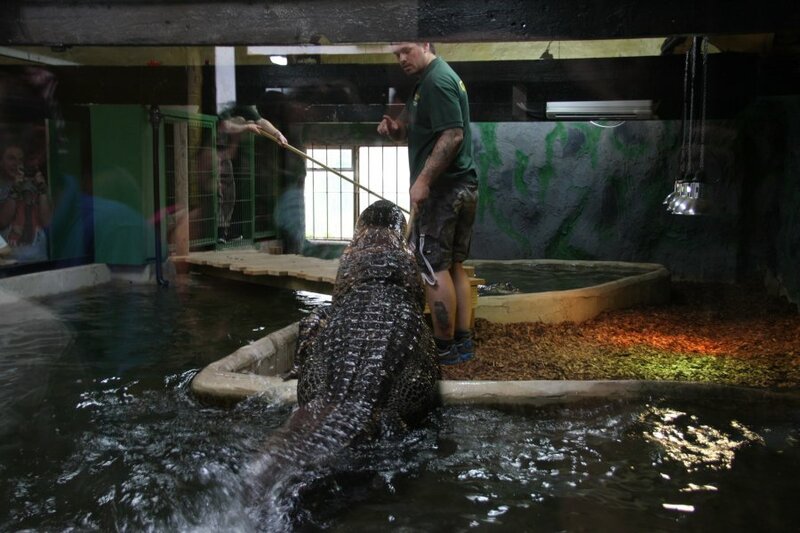 A few months later, we returned to Crocodiles Of The World at their new site. 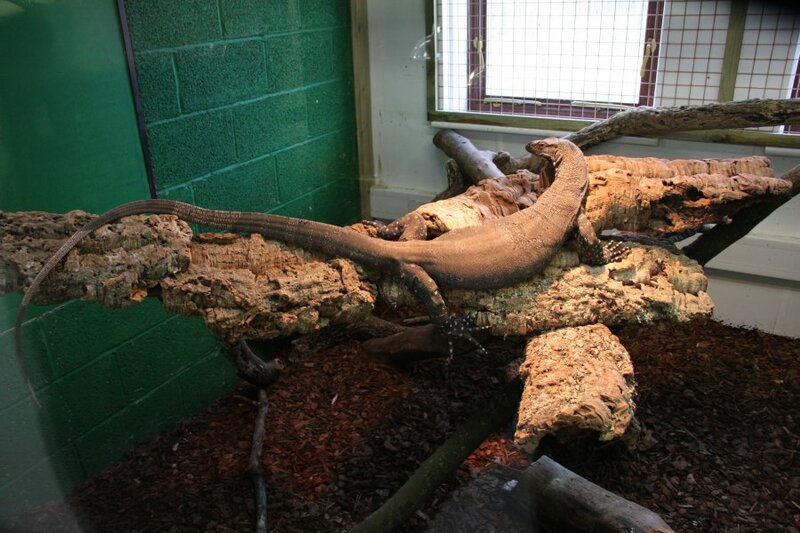 This is their lace monitor, another of the slim-bodied monitors. 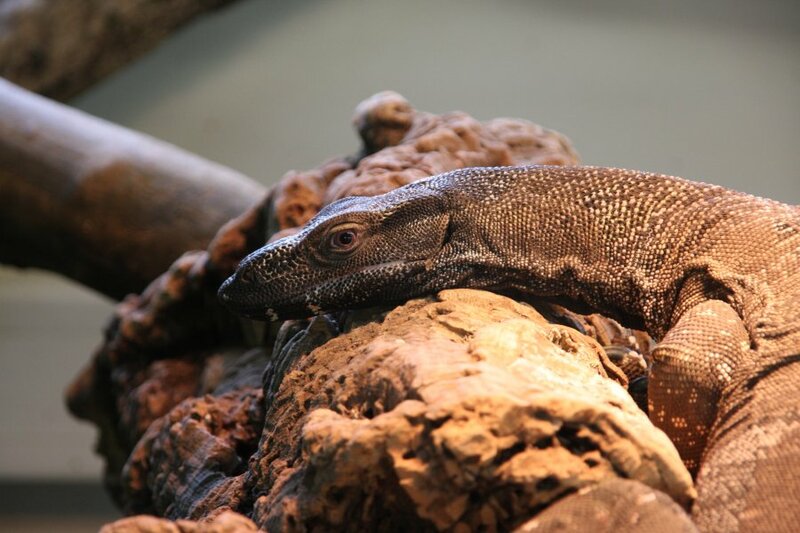 This, along with the Komodo Dragon, is one of the first monitor lizards to have been found to have venomous proteins in their saliva, but the venom is not particularly potent. Striking, long face. 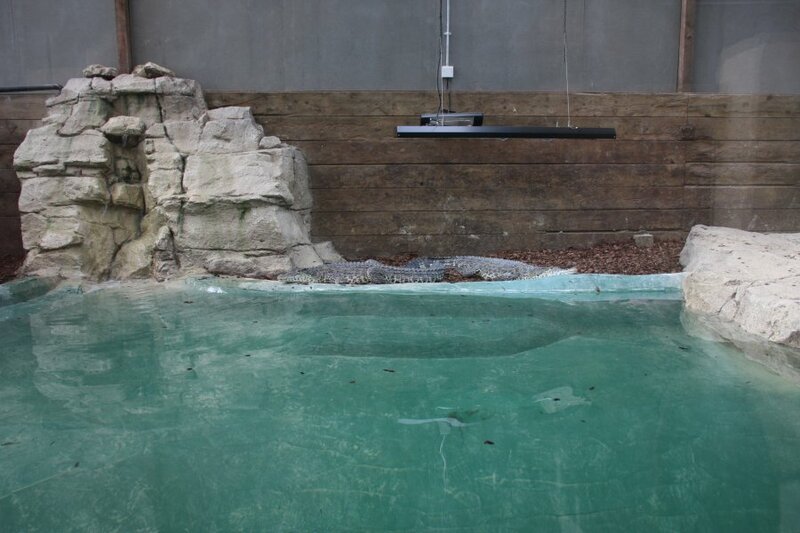 Quite similar to the crocodile monitor. 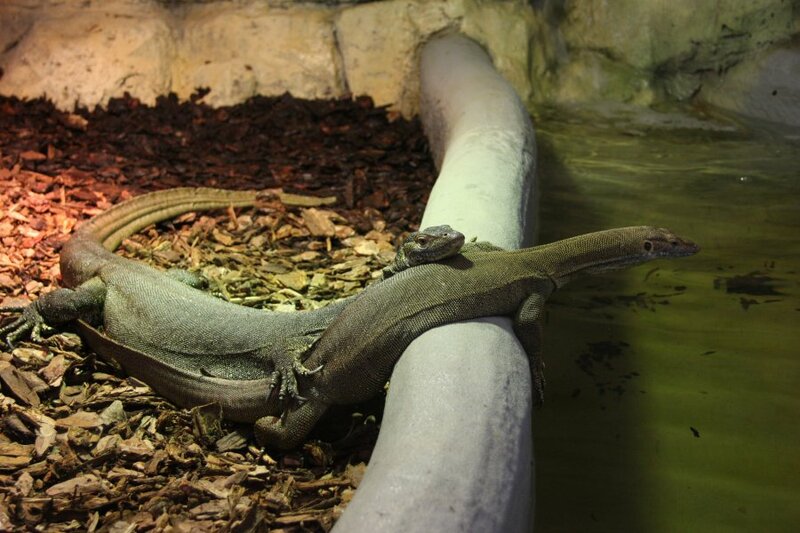 Mertens' water monitors, fairly small monitor lizards. Erm, hello? I am watching you. 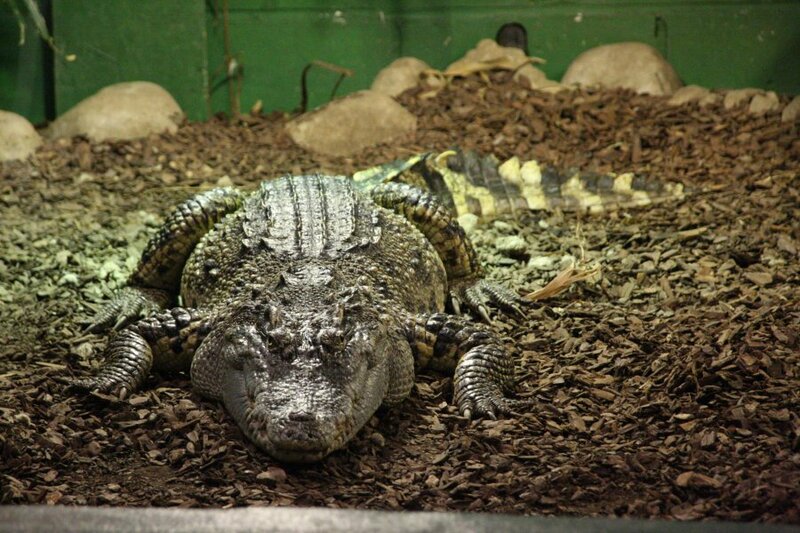 Daisy the American alligator, resting in her enclosure. 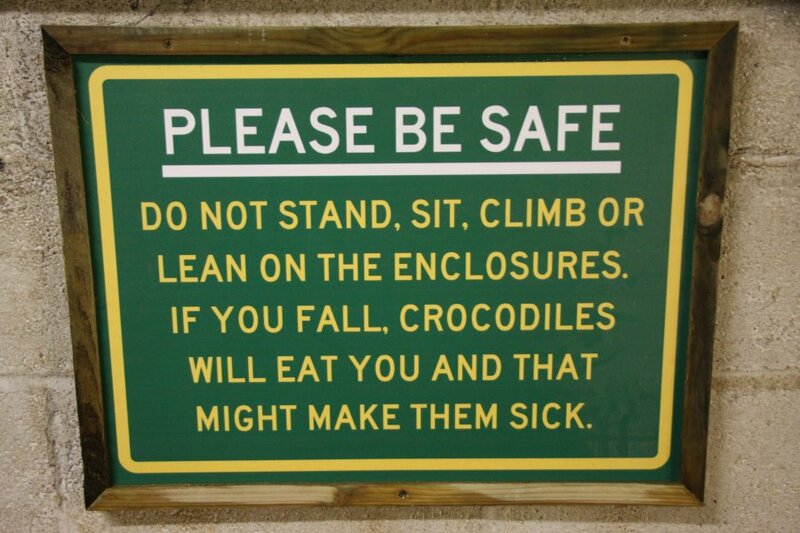 Light-hearted warning at the alligator enclosure. 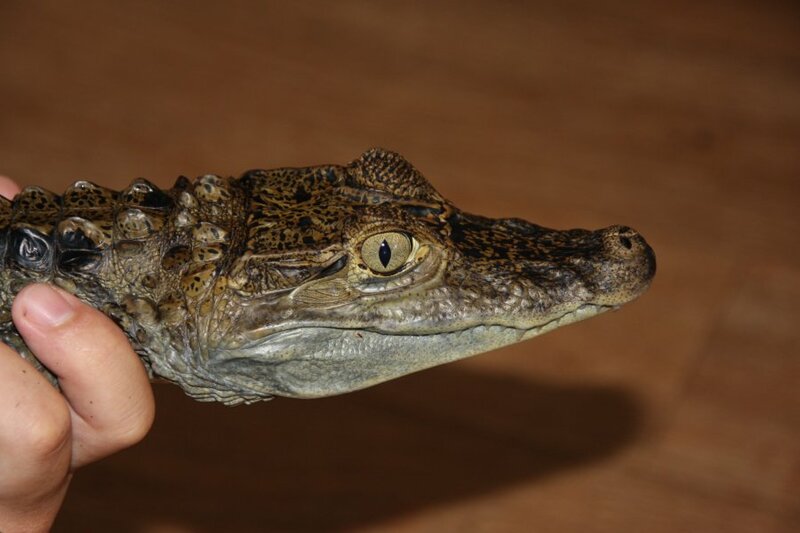 Broad-snouted caiman, which looks very similar to a spectacled caiman, even with the same wrinkle in front of the eyes. 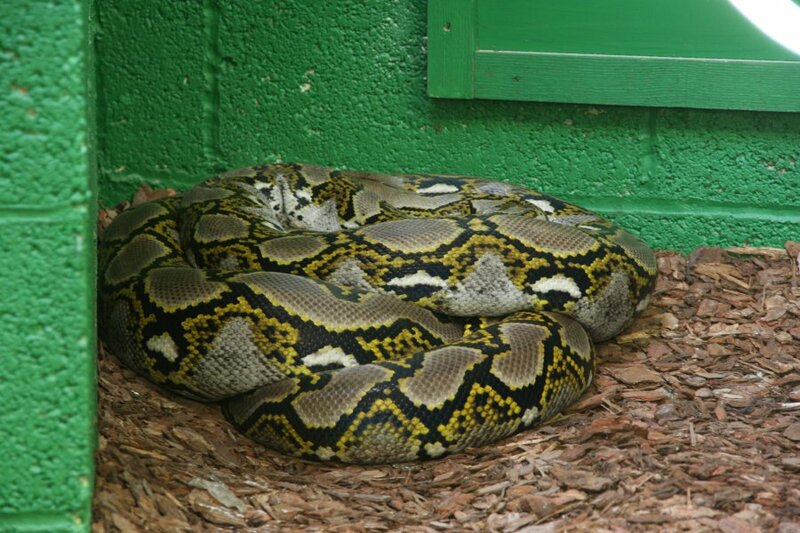 Relatively small reticulated python. That's not a crocodile, but neither are the lizards. 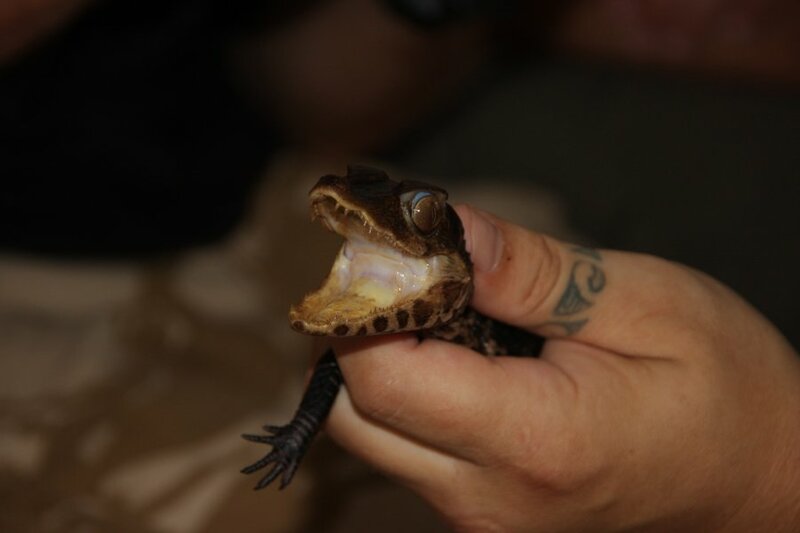 Decorated body of a Schneider's dwarf caiman. 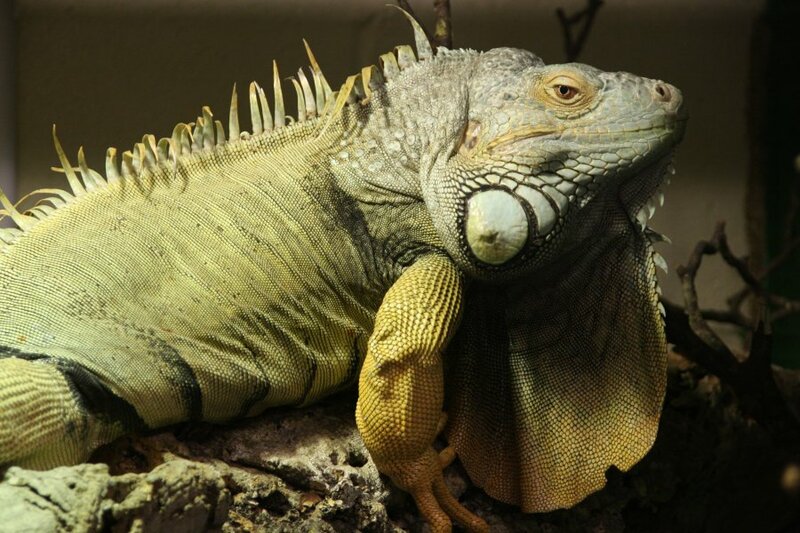 Green iguana, a large male. 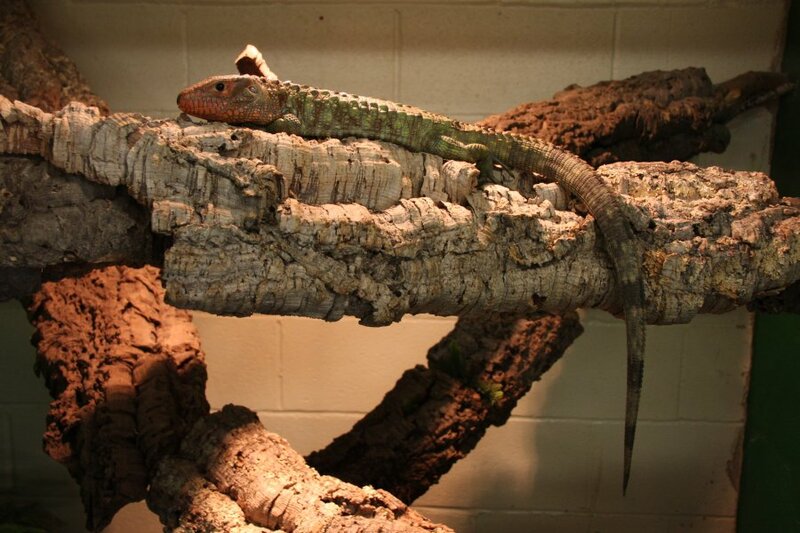 Very intelligent for a lizard, capable of recognising and bonding with owners, learning to use the toilet outside, playing fetch, opening and climbing into its enclosure. With intelligence comes moods, however, and these lizards can take offence to specific people and hold a grudge for years. Or decide only to accept men, or women, even being affected by hormonal changes in the people they bond with. 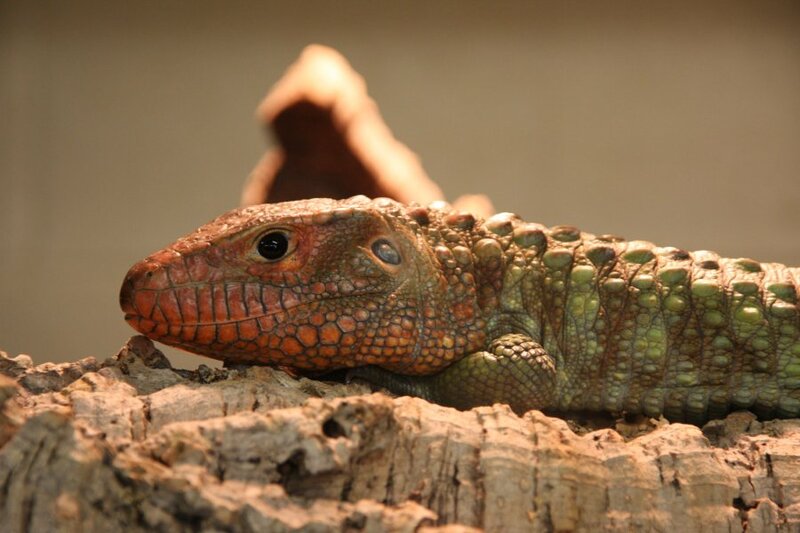 Northern caiman lizard, a large lizard related to tegus. Difficult to feed, difficult to house. 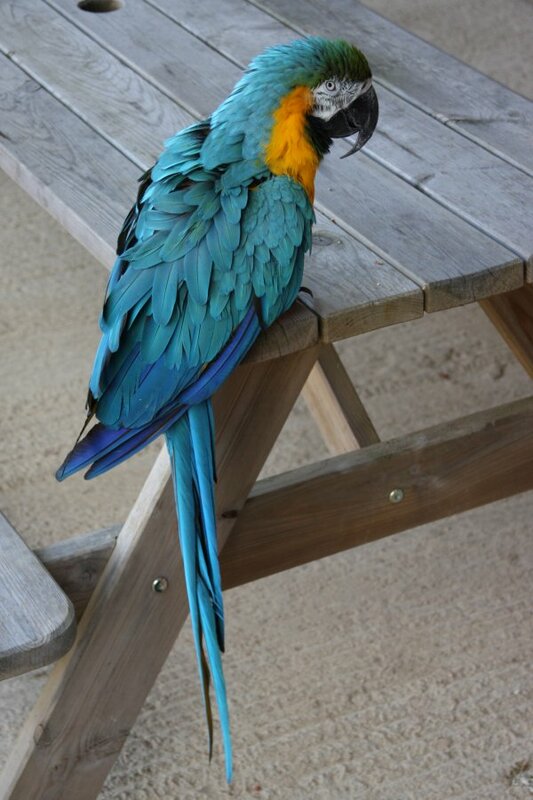 Maccaw, a blue and yellow, if I am not mistaken. Even less of a crocodile than the snake. It has learned to reply with a very clear "hello" whenever someone says the word. Although free to fly off, the pair of maccaws are happy where they are. 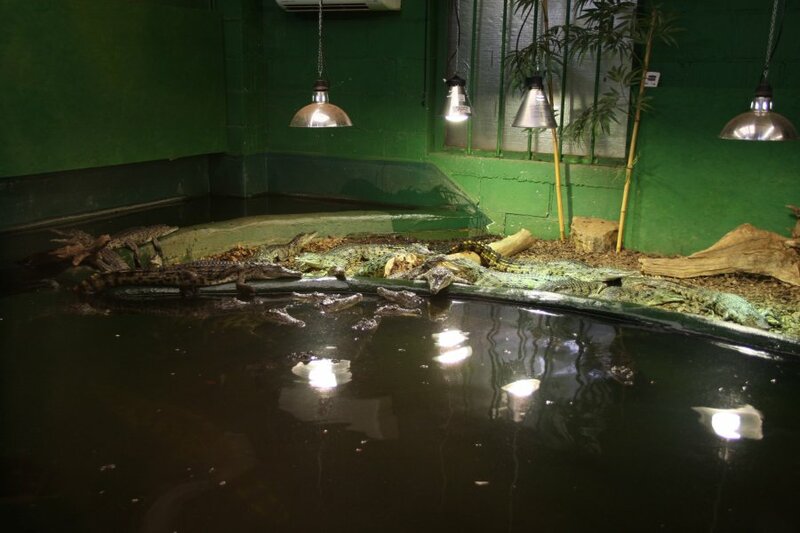 Cuban crocodiles in their new enclosure. 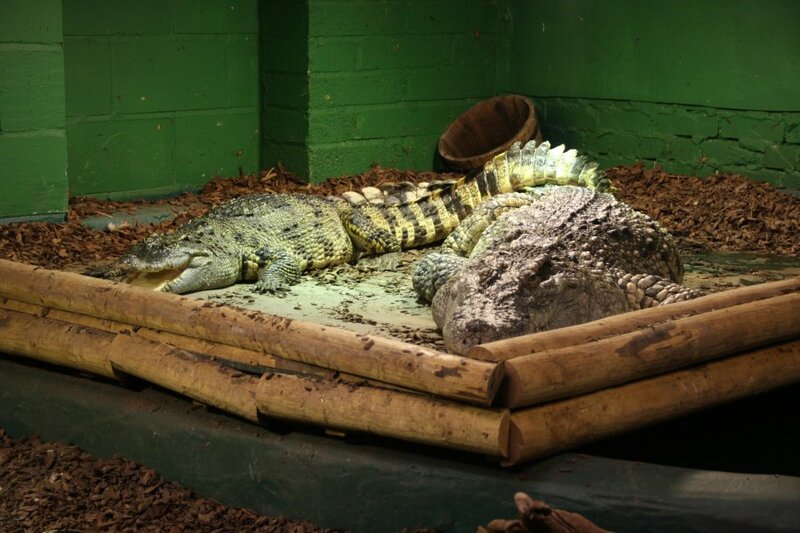 These are quite large crocodiles, but the enclosure makes them look small. 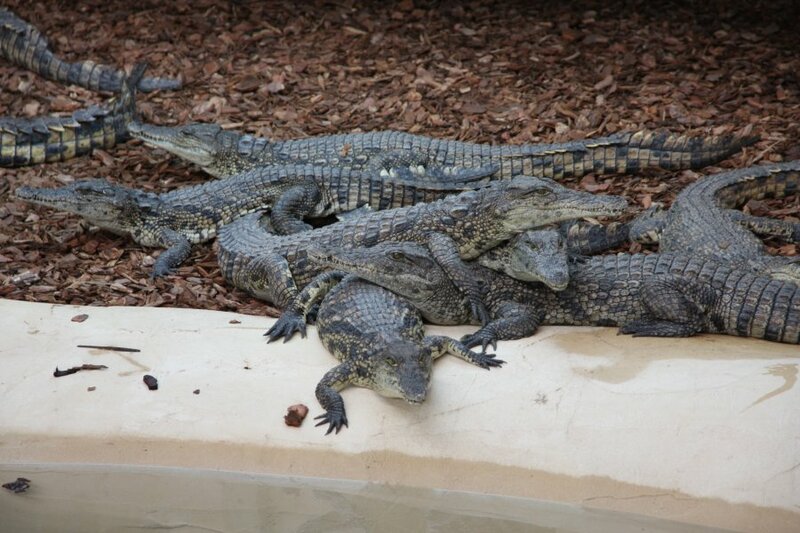 Croc-pile at the Nile crocodile enclosure. 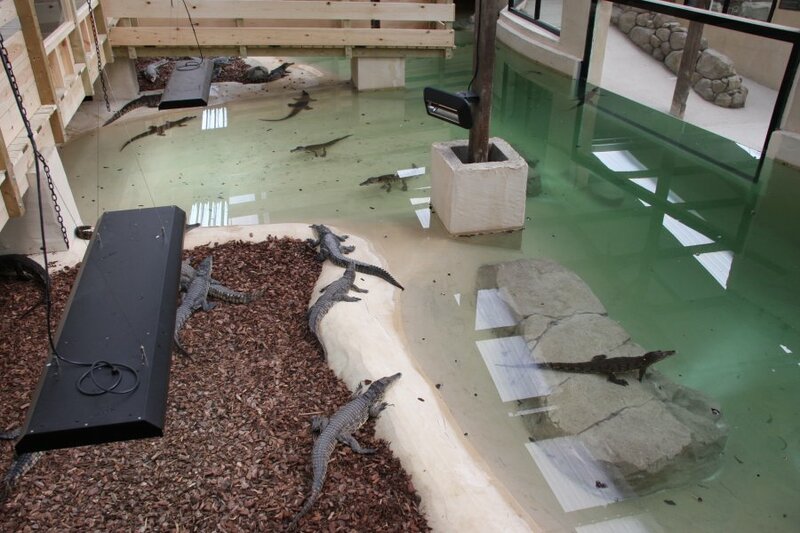 The 19 young Nile crocodiles share this enormous enclosure, with powerful UV lighting rigs, a heated building, and extra hotspots. 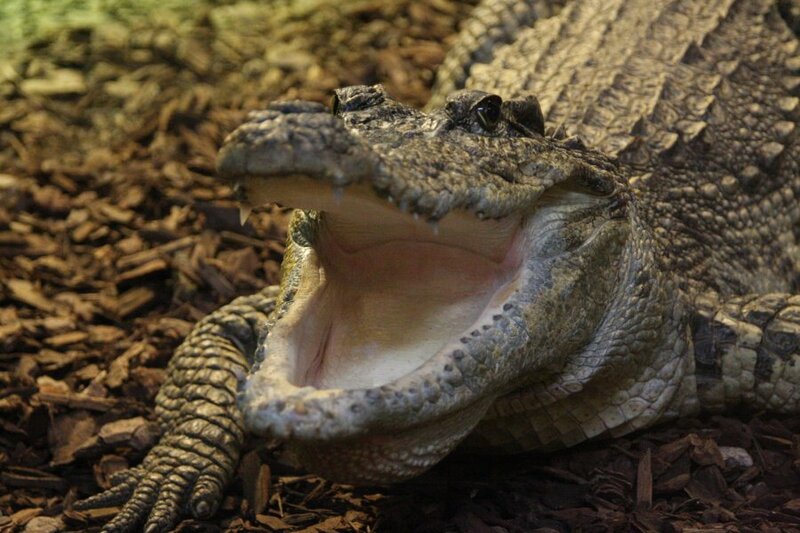 Nile crocodile teeth. This shows nicely that these are crocodiles, not alligators, as the teeth on the lower jaw often sit in front of the upper lip. 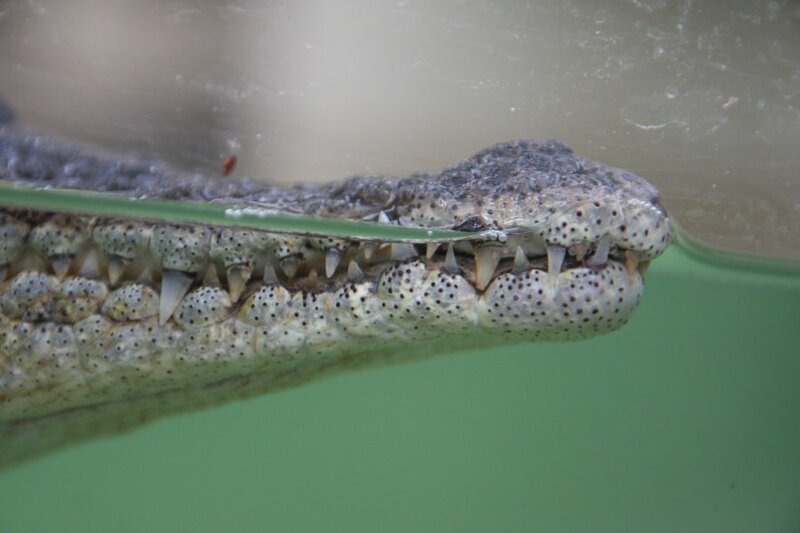 On an alligator, the lower teeth sit inside the upper lip. Morelet's crocodile, another of the large crocodiles at about 3 metres.